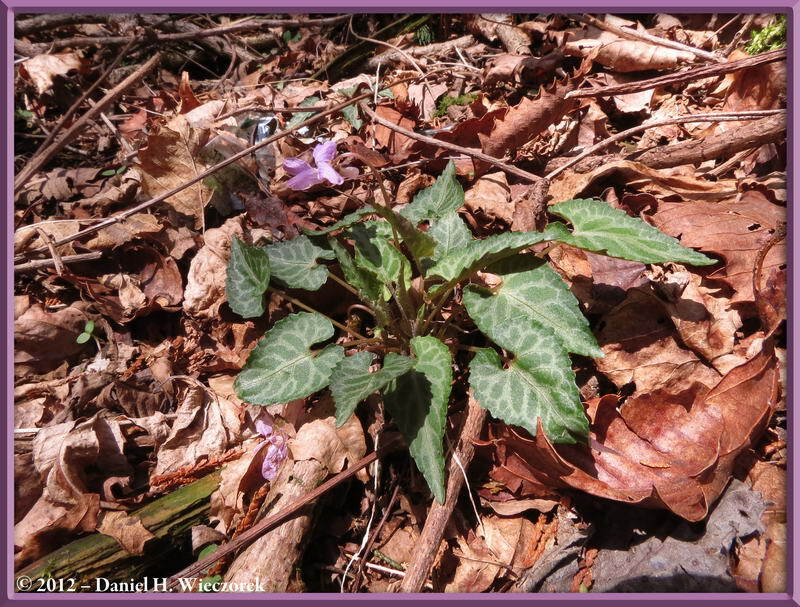 This is Page 3 of 4 - the best of April 2012! This page begins with April 21st. 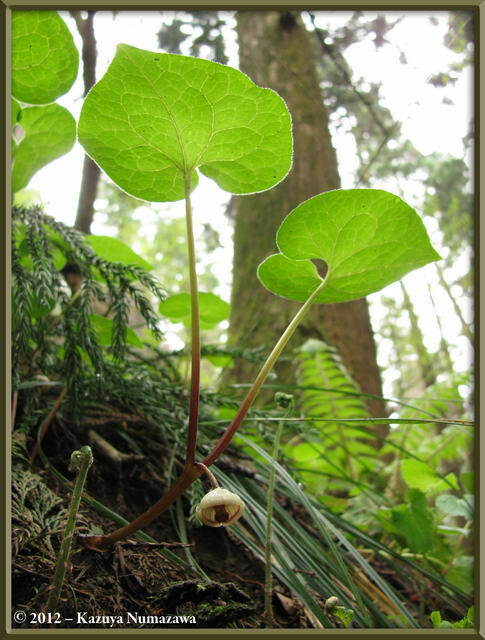 Kazuya and I went out to Hikage Creek and found much more than we had expected to find, so we climbed to the summit of Mt. 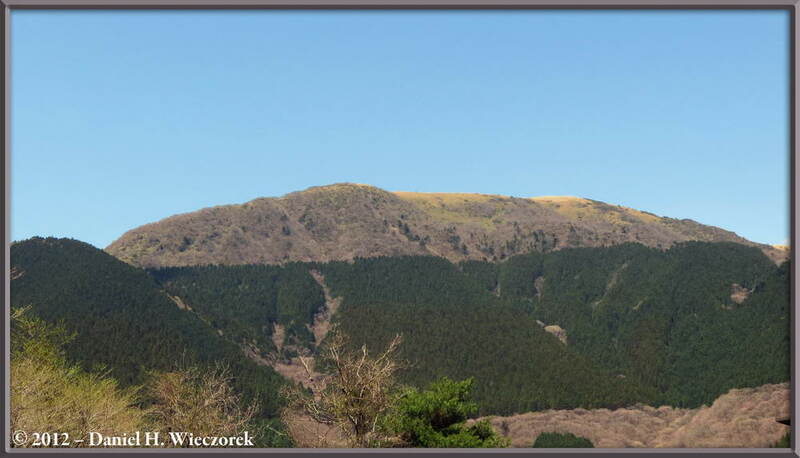 Kobotoke-Shiro (670 m = 2,199 ft) for the 30th time and also Mt. Takao (599 m = 1,965 ft) for the 74th time. 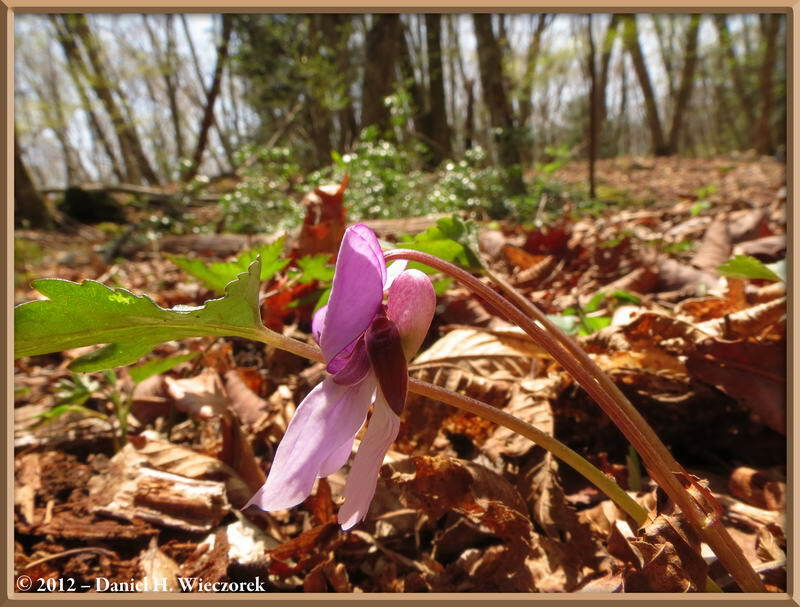 It was a good day, despite being mostly cloudy all day. 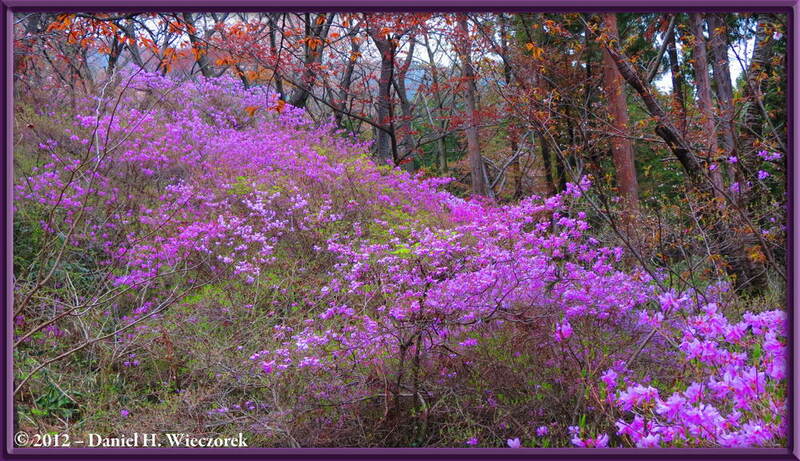 Then, on April 28th we took a train early in the morning and went to Kawaguchi Lake. From there we took a bus for about an hour, and then we spent the rest of the day hiking. The weather was great! Click on any thumbnail to begin. 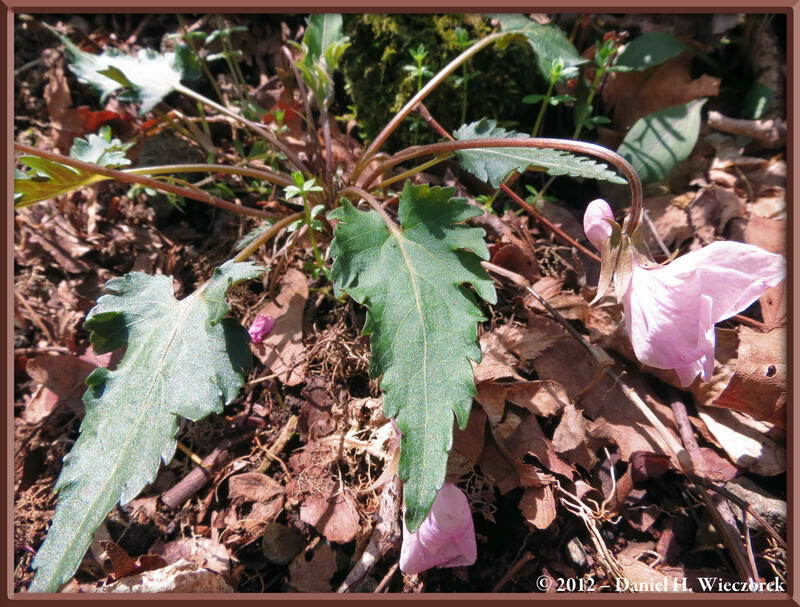 As it says above, we went out to Hikage Creek on April 21st and hiked all the way up to the Summit of Mt. Kobotoke-Shiro. 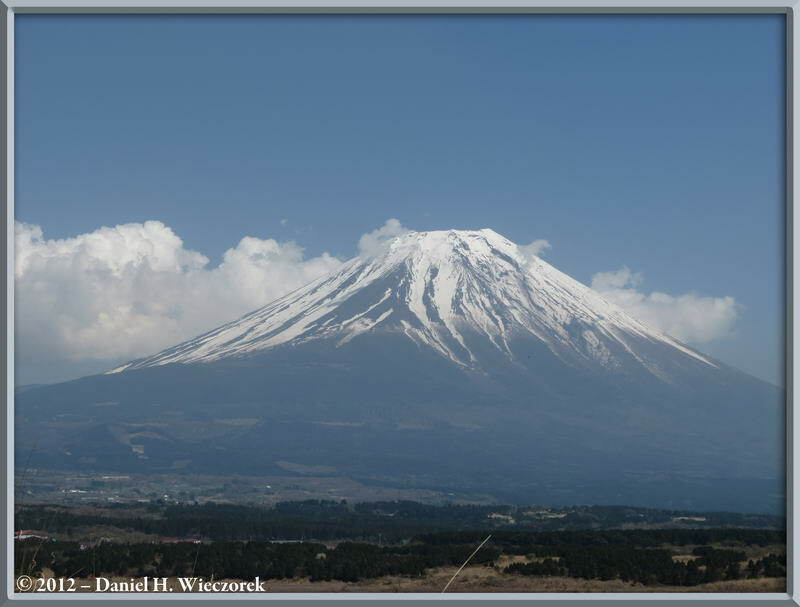 Then we hiked to I-Ccho-Daira and from there to the summit of Mt. Takao. 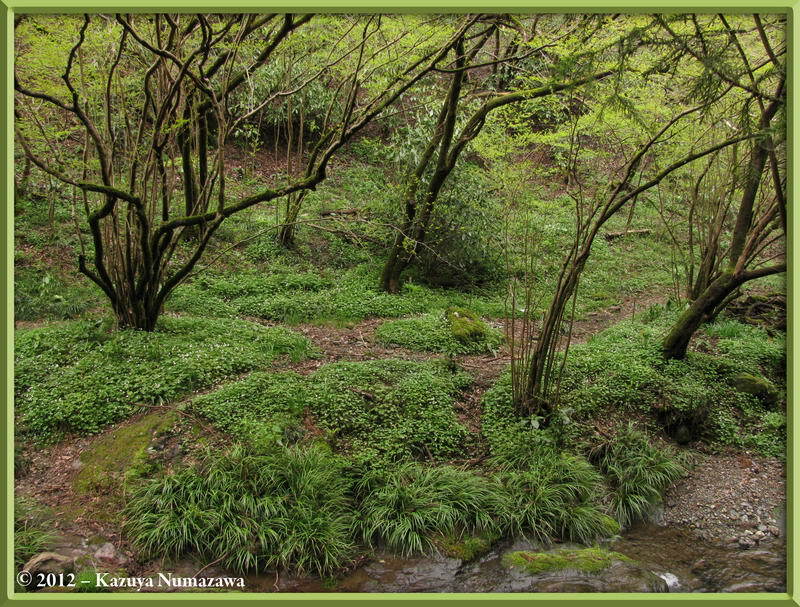 The first shot in this row is a shot of spring greenery at Hikage Creek. 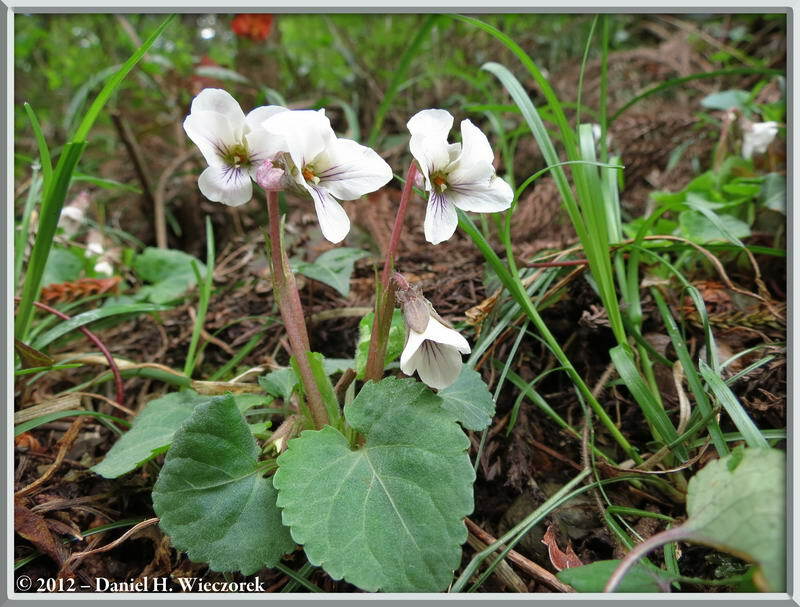 The next 2 shots show you Viola yezoensis f. discolor - a violet which we search for every spring, but most years lately we have not found so many of them. 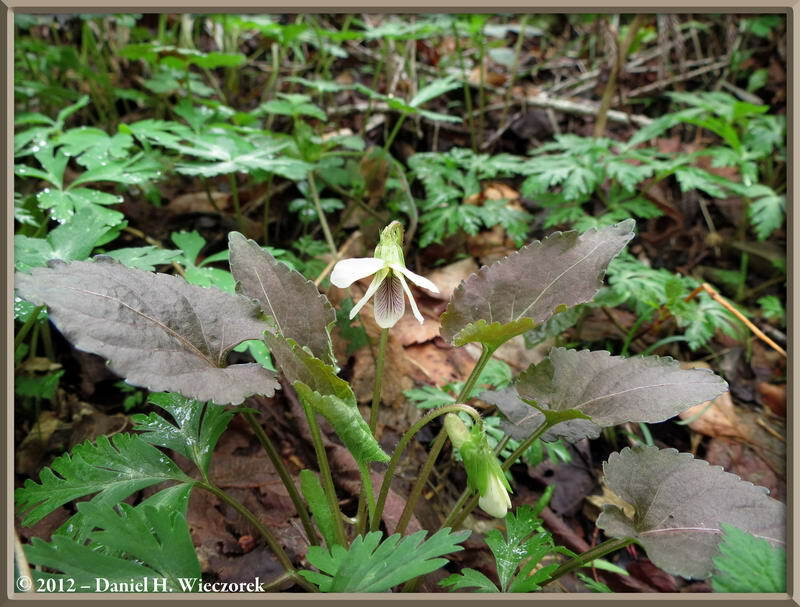 Today we found an abundance of them, so you should expect to see many photos of that species on this page. 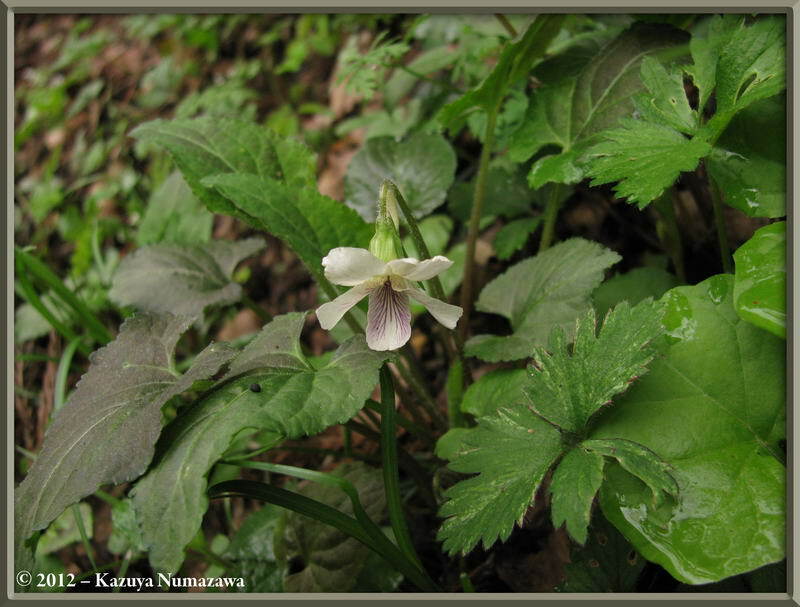 The common name of this violet is "The Takao Violet". 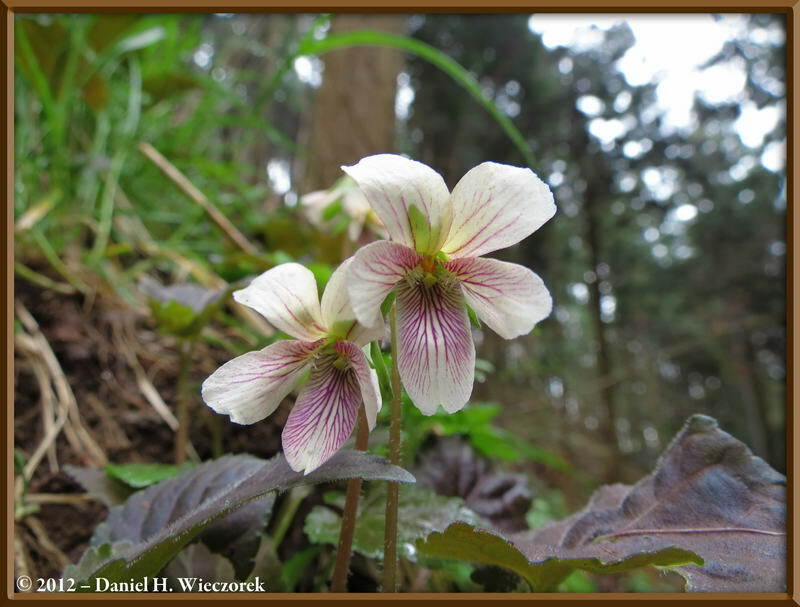 Here are 2 more shots of "The Takao Violet" (Viola yezoensis f. discolor). 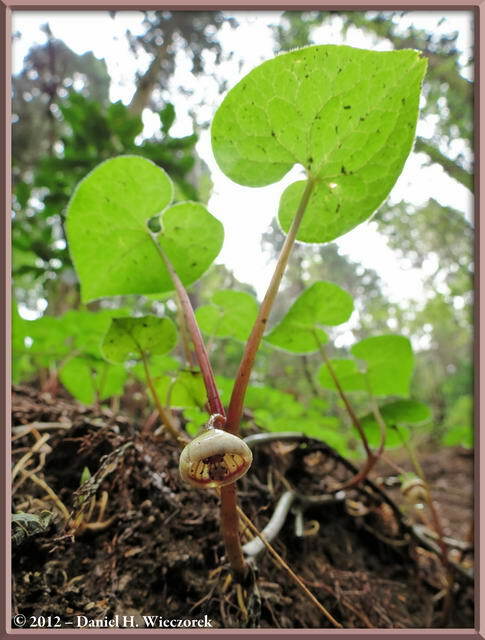 Can you deduce why the forma of this species is named "discolor" - it's probably because of the weird leaf color - purplish brown. 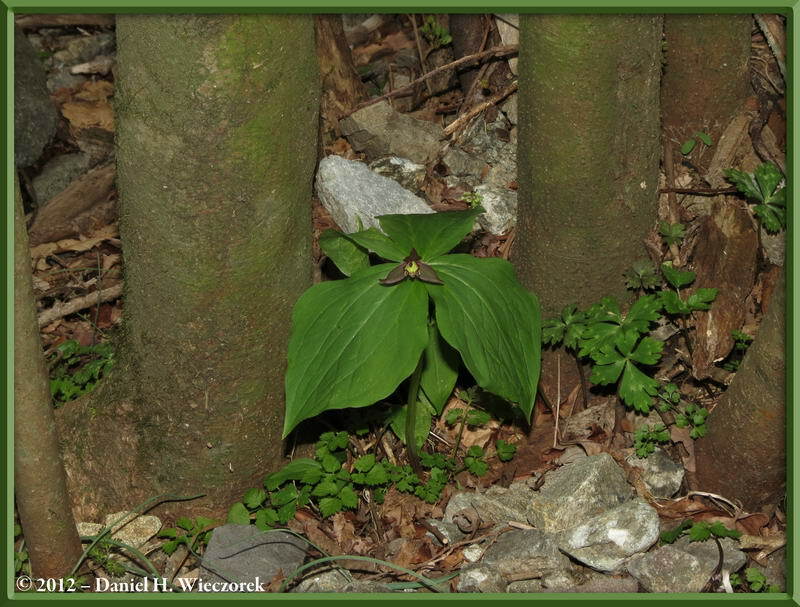 The 3rd shot in this row is a Trillium smallii which, unfortunately, has already finished blooming. 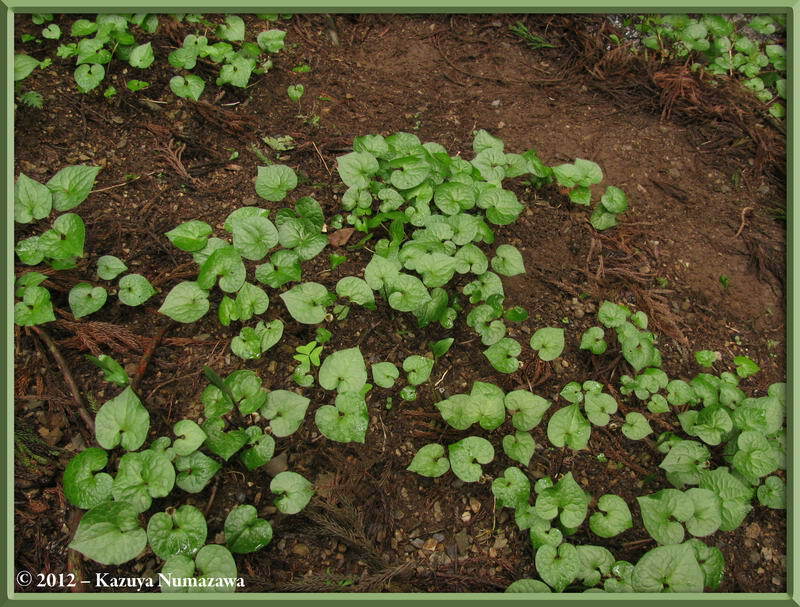 The first and 3rd shots in this row are Viola keiskei. 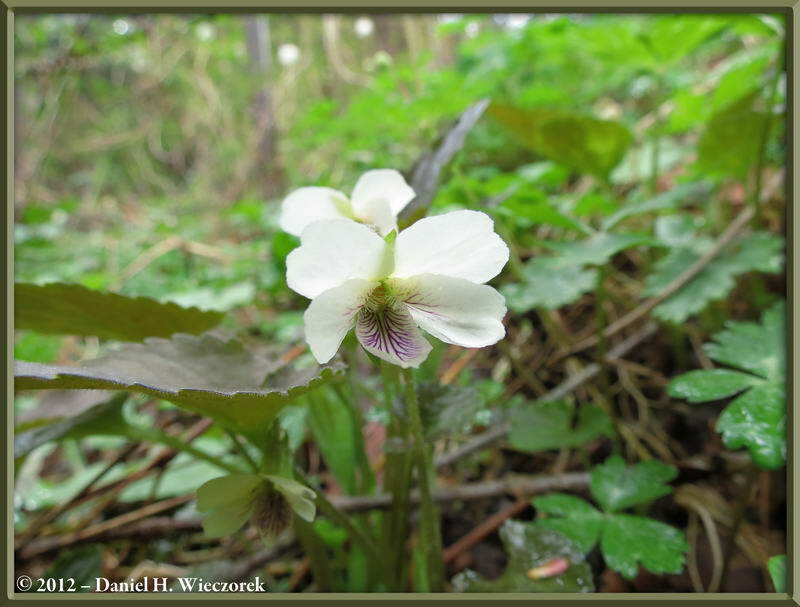 In center position is a shot of a white flowered Hikage Violet (Viola yezoensis) (leaves not "discolored") and a purplish colored Viola grypoceras. 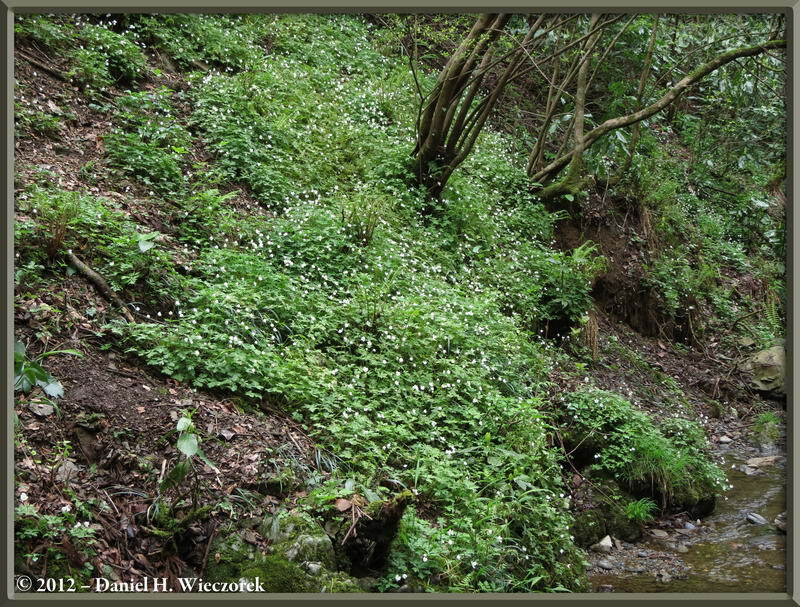 In first position in this row is a shot Anemone flaccida and in 3rd position is a huge patch of them on the other side of the creek. 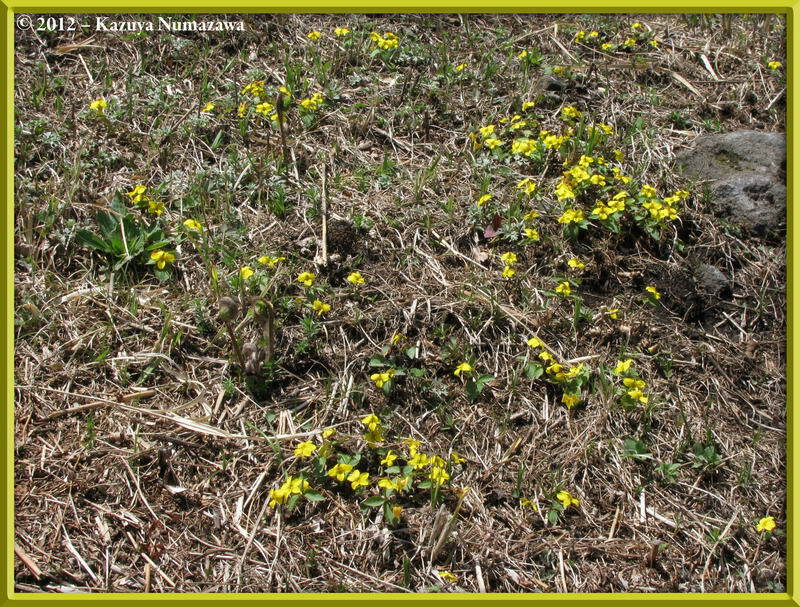 In center position is a Viola keiskei. 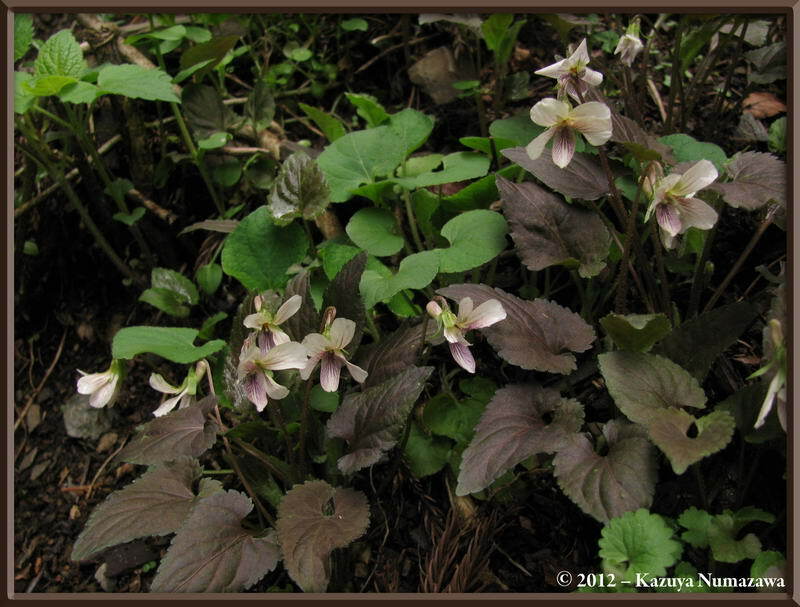 Here are 3 more shots of "The Takao Violet" (Viola yezoensis f. discolor). 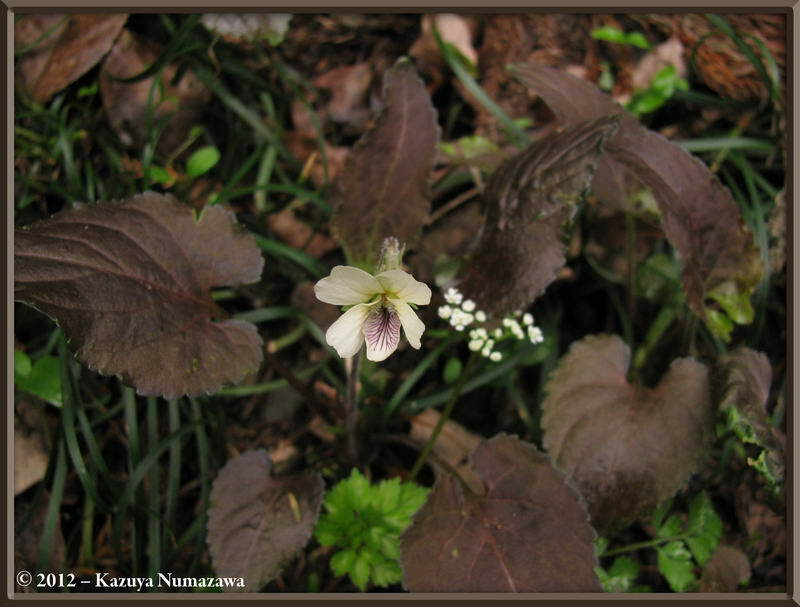 And, here are another 3 shots of "The Takao Violet" (Viola yezoensis f. discolor). 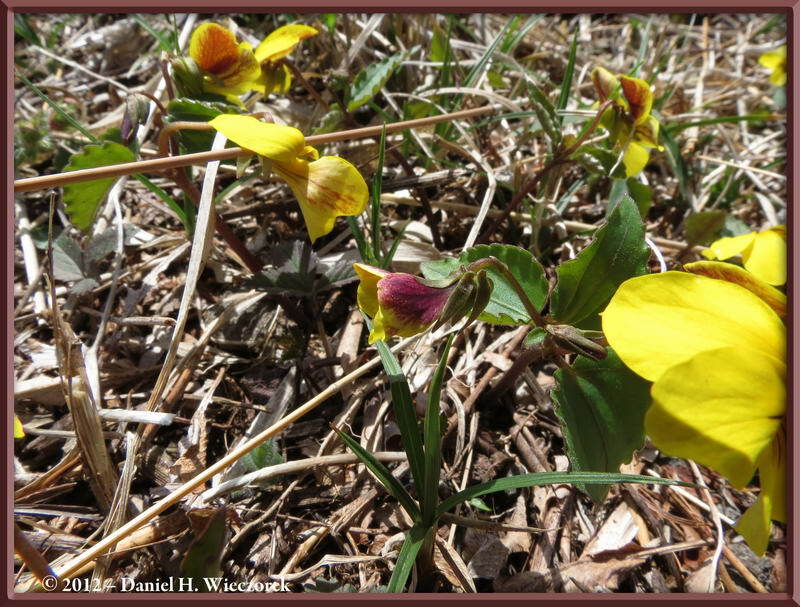 In first and 3rd positions in this row is a weirdly pinkish colored Viola keiskei. 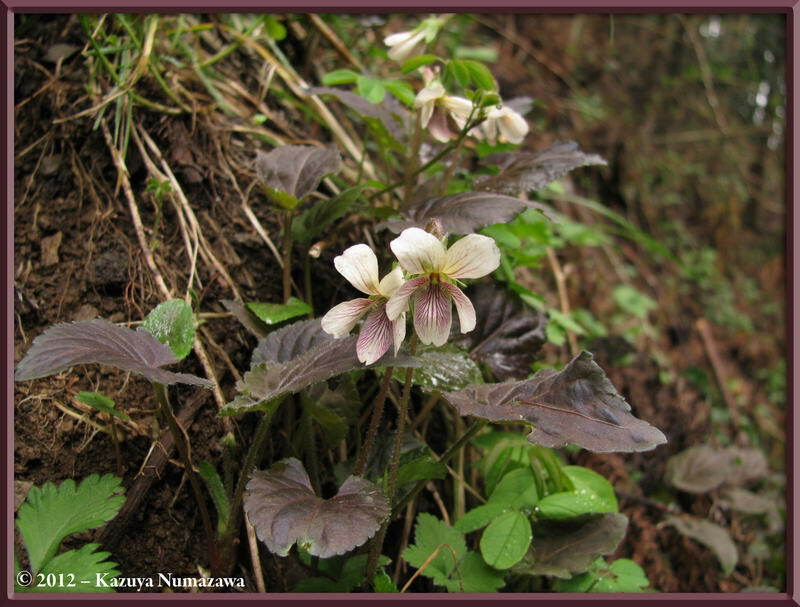 In the center is an overview of "The Takao Violet" (Viola yezoensis f. discolor). 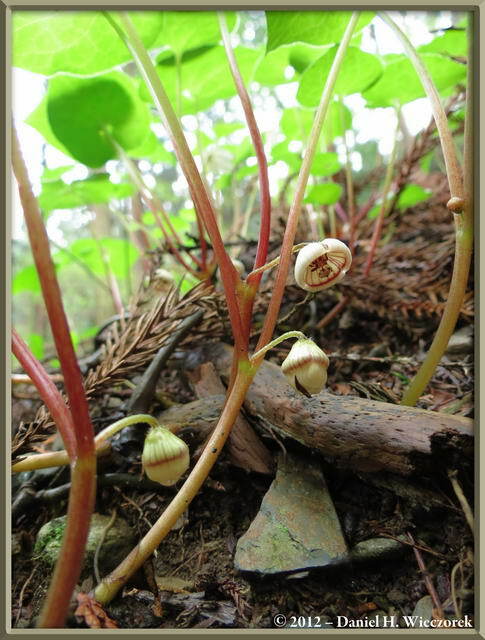 Here are 3 shots of Asarum caulescens. 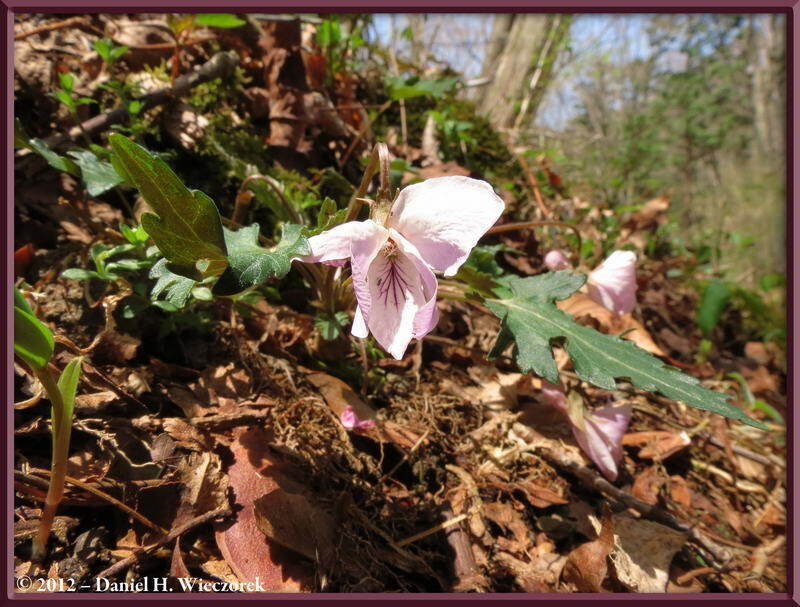 We had never seen so many in bloom at one time. 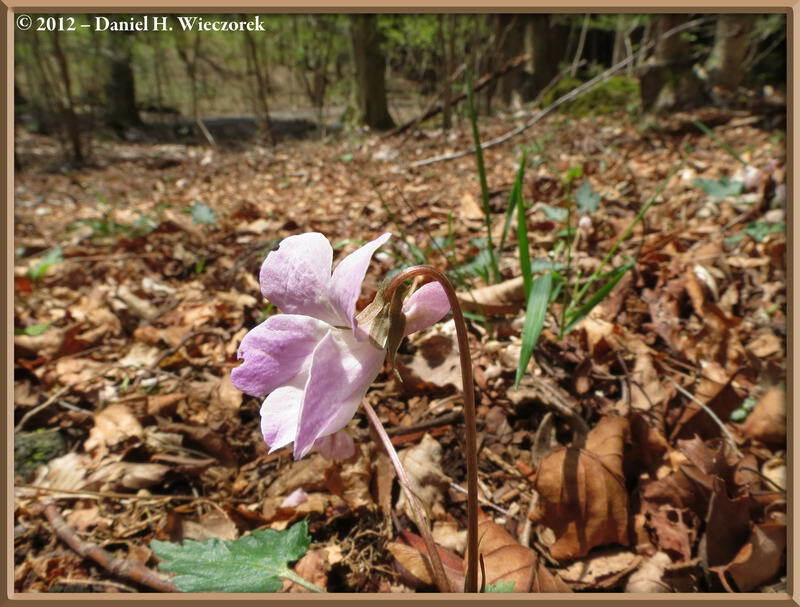 It is really difficult to get the flower and the leaves in a single shot, but you'll note that we succeeded pretty well with the 1st and 2nd shots. 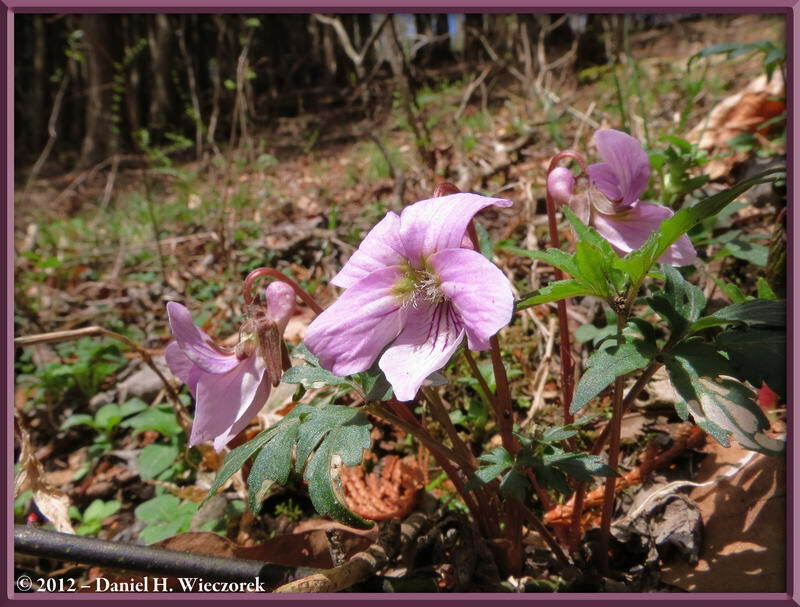 For the 3rd shot I concentrated on the flower and buds. 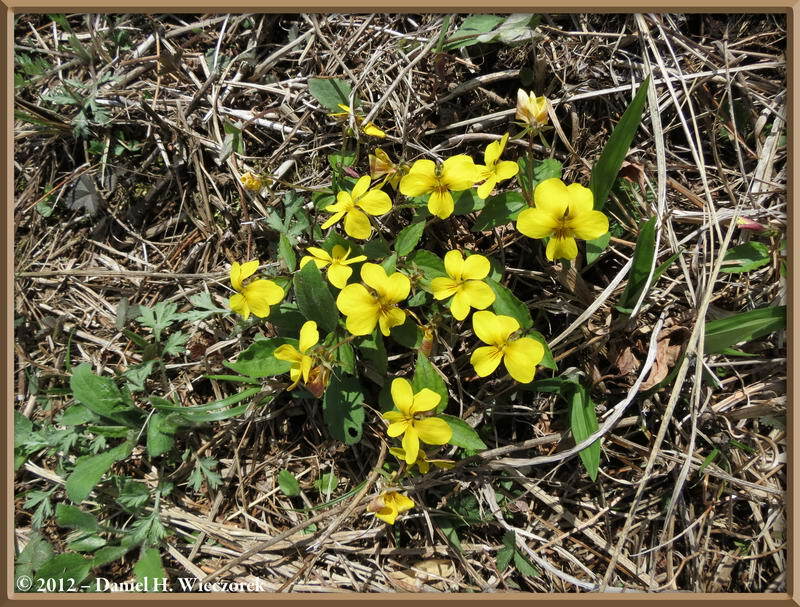 In all of the shots in this row you can note how many flowers there are of this species this year. Oh heavens, what have they found that they are probably destroying? I snuck up and found that it was some kind of fly which had recently emerged from the stream and was drying its wings. Wonder if it was still alive when they left? 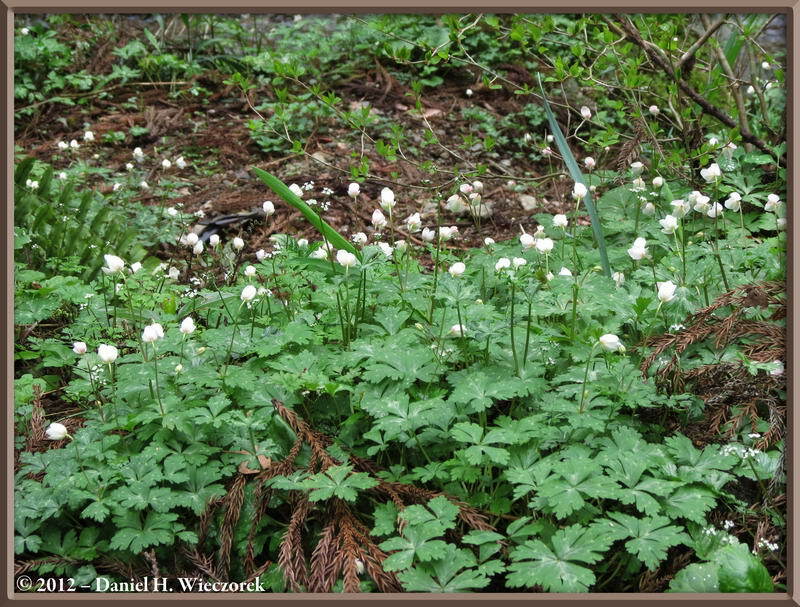 In 2nd and 3rd position is a patch of Anemone flaccida. 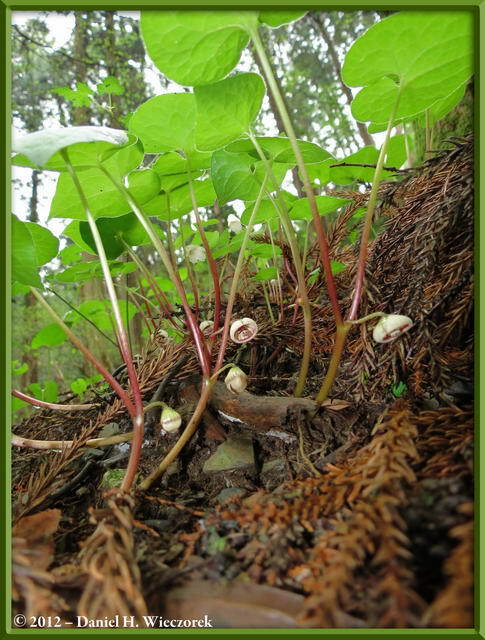 The 2nd shot is a overview and I zoomed in a bit for the 3rd shot. 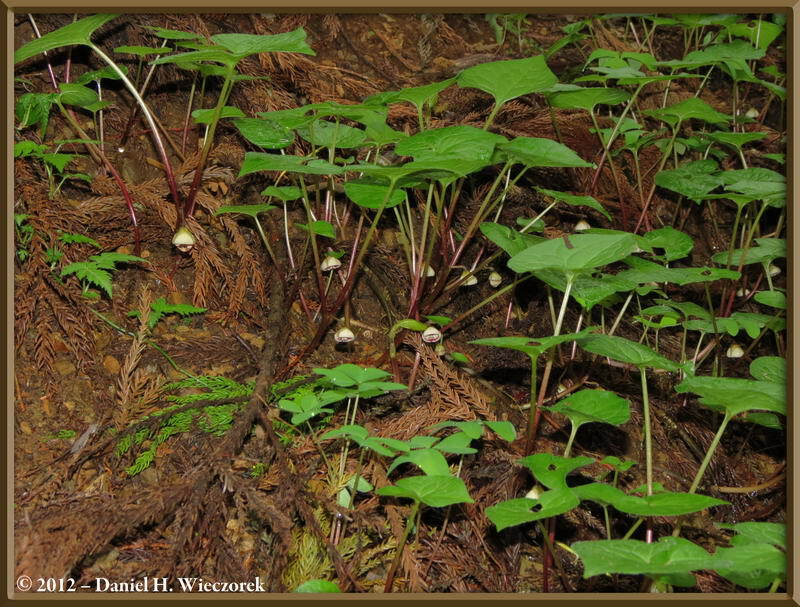 In the next row I have included a shot which I zoomed in on even more. 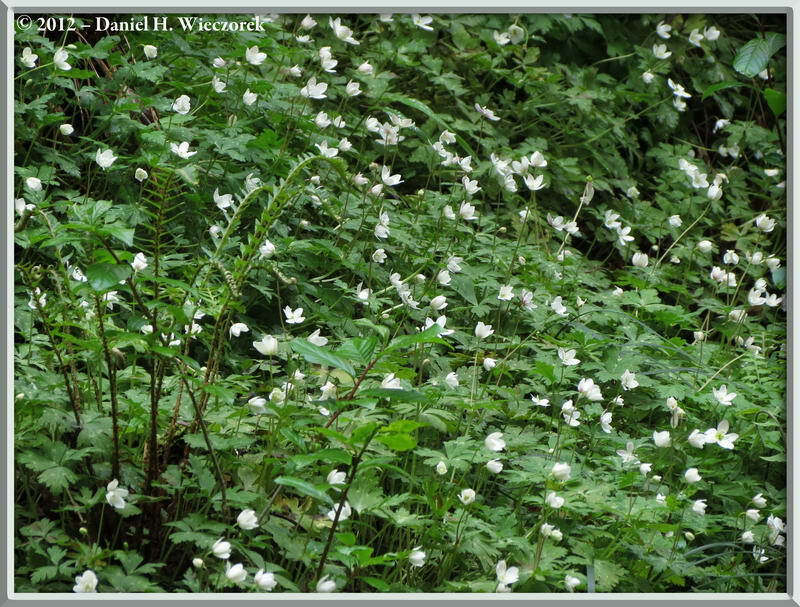 In 1st position is the same patch of Anemone flaccida which you saw in the row just above. I have zoomed in even more for this shot. 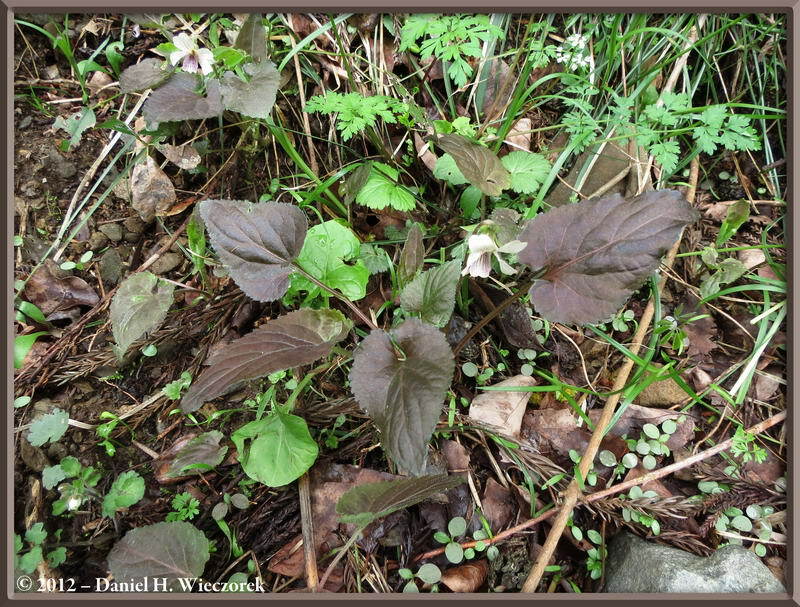 The 2nd shot is a VERY dark colored Viola yezoensis f. discolor while the 3rd shot shows a patch of Hikage Violet - Viola yezoensis (leaves not discolored). 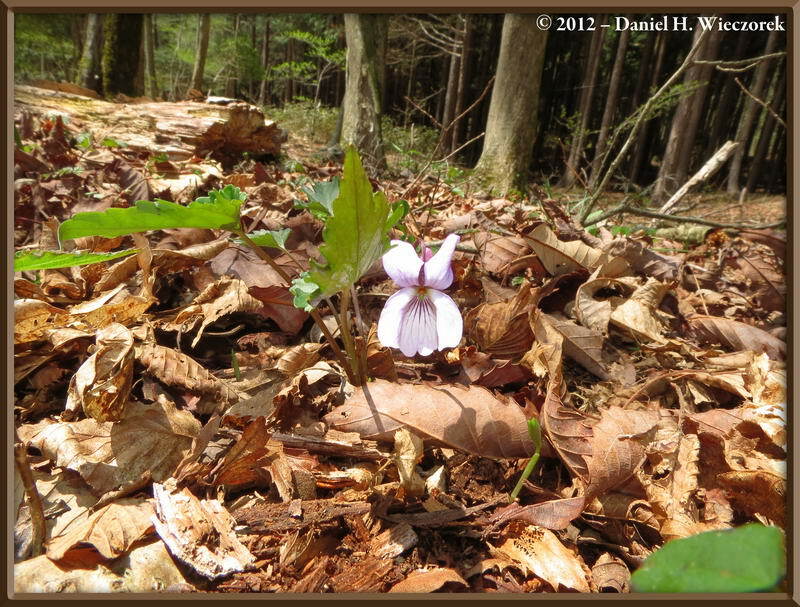 Here is that patch of Viola yezoensis (Hikage Violet) again and its followed by 2 shots of Viola yezoensis f. discolor. 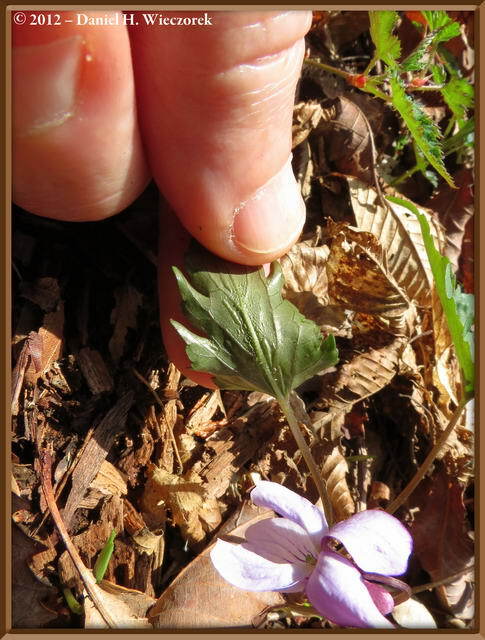 Click the above button for a Special Page Dedicated to the Violets which we have identified with confidence. 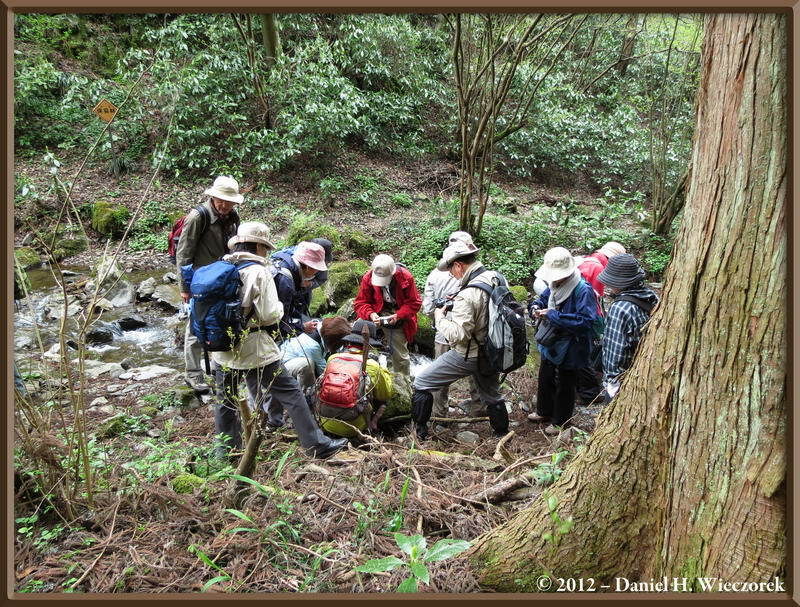 Now we are getting up towards the summit of Mt. 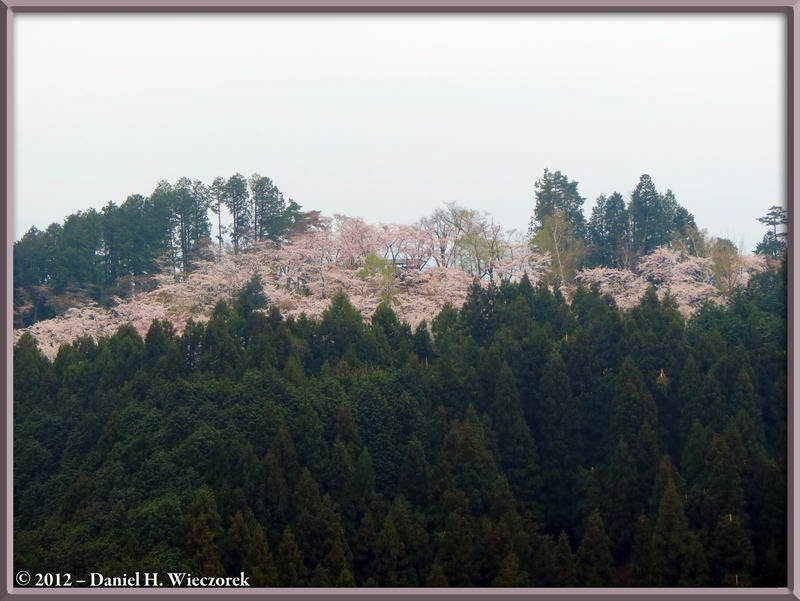 Kobotoke-Shiro and looking across to the Mountain Cherry on I-Ccho-Daira. We'll be going over there. For this image I took 3 exposure-bracketed shots and created this HDR (High Dynamic Range) photo with Photomatix Pro. I used the Tone-Compressor Option for tone-mapping the 3 exposure-bracketed shots. 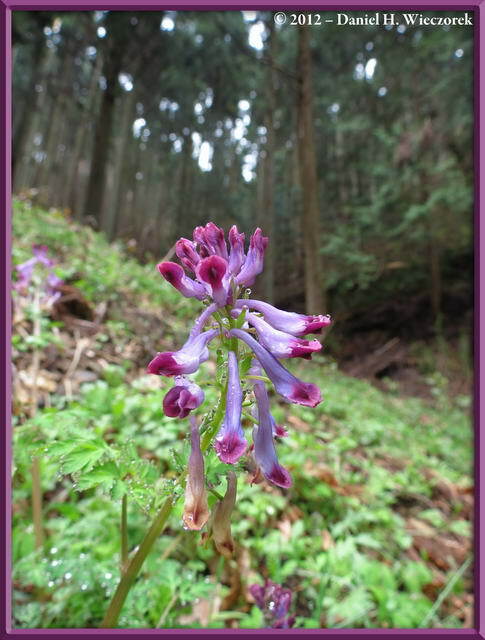 The 2nd shot is a Corydalis sp. 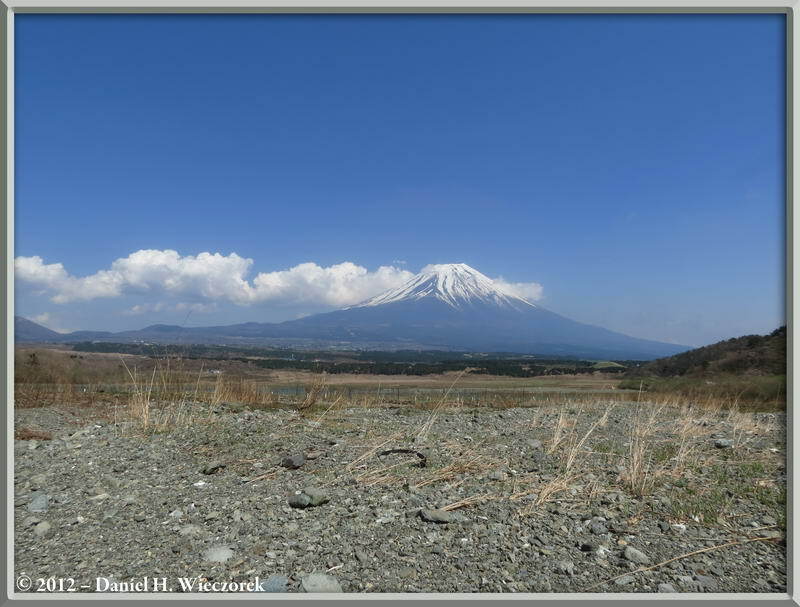 The 3rd shot was taken at I-Ccho-Daira - the place which you see in the first shot in this row. 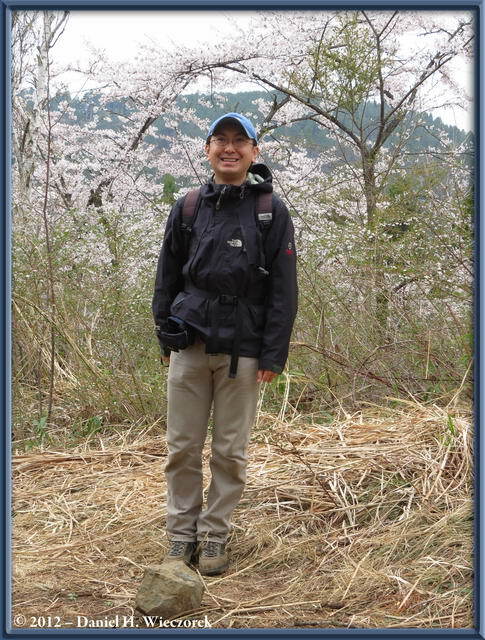 And, here is a shot of me and also a shot of Kazuya which we took at I-Ccho-Daira with the Yama-zakura (Mountain Cherry) blossoms as our background. 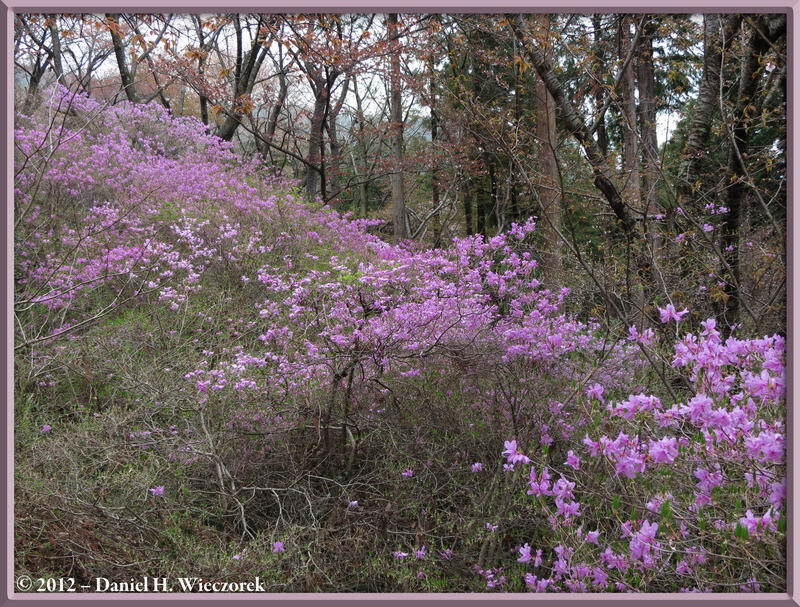 The 3rd shot is an area of Mountain Azalea. This was not yet at its peak - some years this spot is absolutely brilliant. 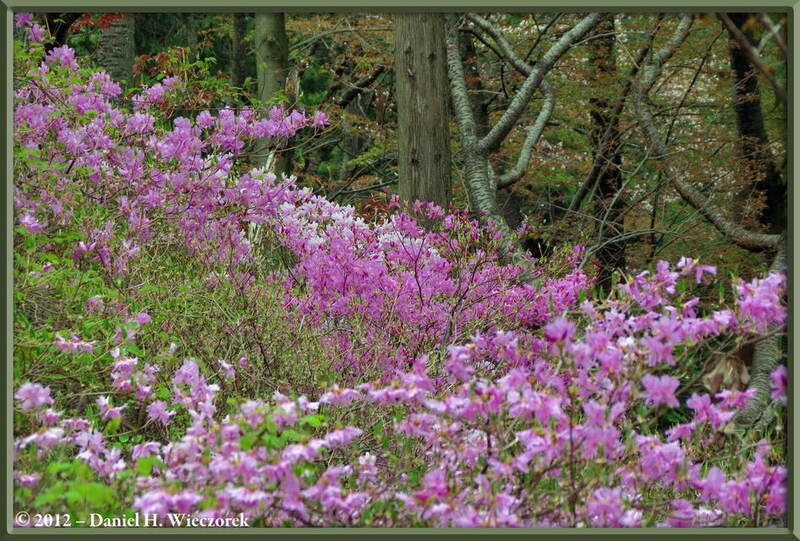 Here are the 2 final shots from this day - both taken at the same Mountain Azalea patch as shown in the 3rd shot in the row above. For the 1st shot I used the Vivid Setting and shot it at 16 x 9. For the 2nd shot I zoomed in a bit, turned off the Vivid Mode, but left 16 x 9 on (I think). 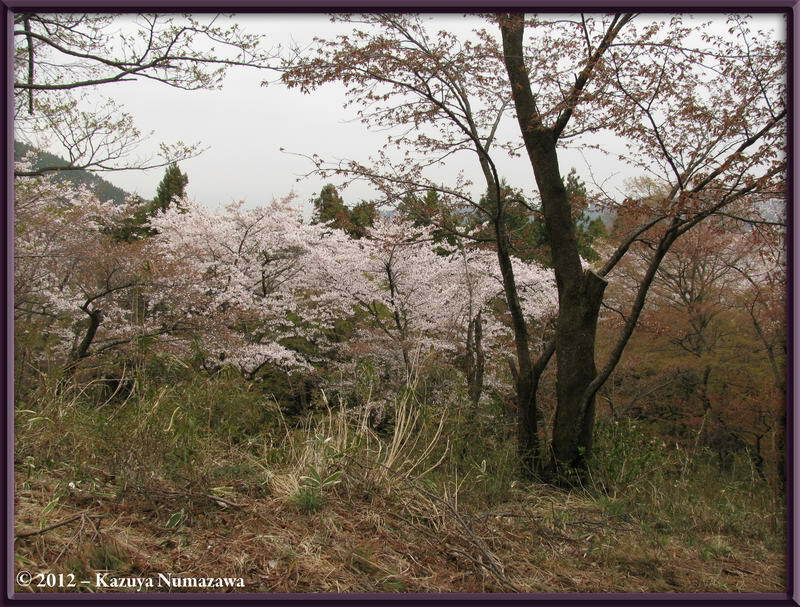 On April 28th Kazuya and I got up at 5:00 AM, got ready and left the house at 5:30 AM. 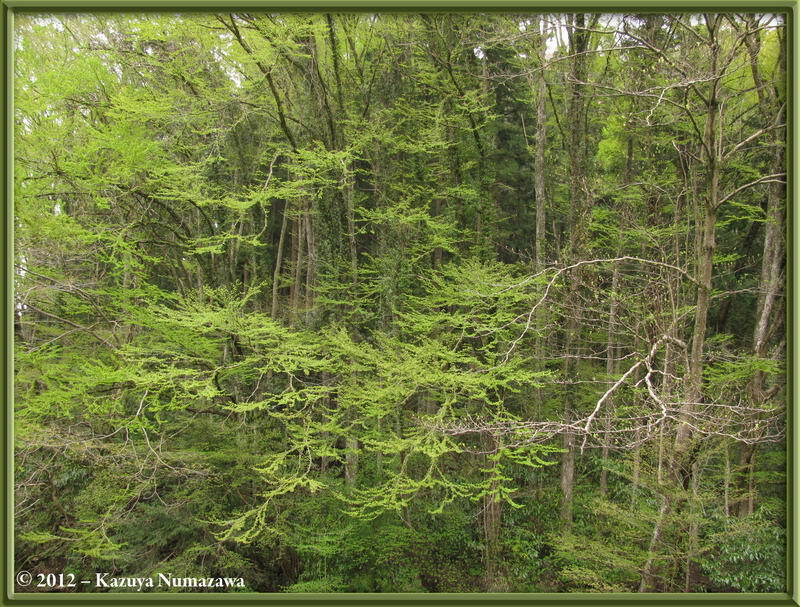 We took a series of trains from Musashisakai (our home station) to Kawaguchi Lake. 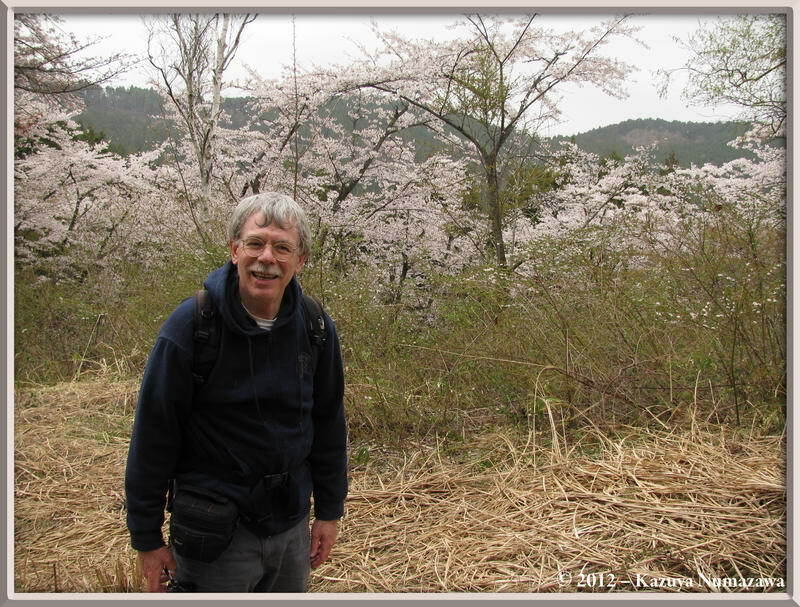 After arriving at Kawaguchi Lake we waited for the first bus to take us to where we wanted to go. The bus took about an hour to get us to our destination, which means we got there at about 10:30 AM. 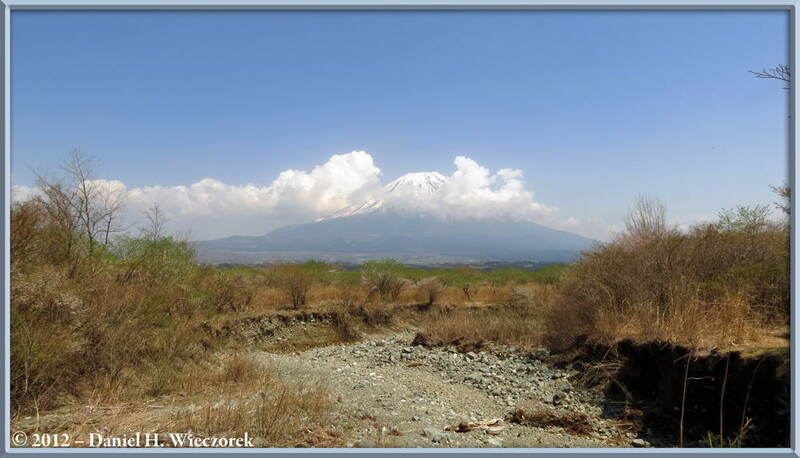 The first photo in this row was taken at Kawaguchi Lake Station at 8:56 AM - it's obviously Mt. 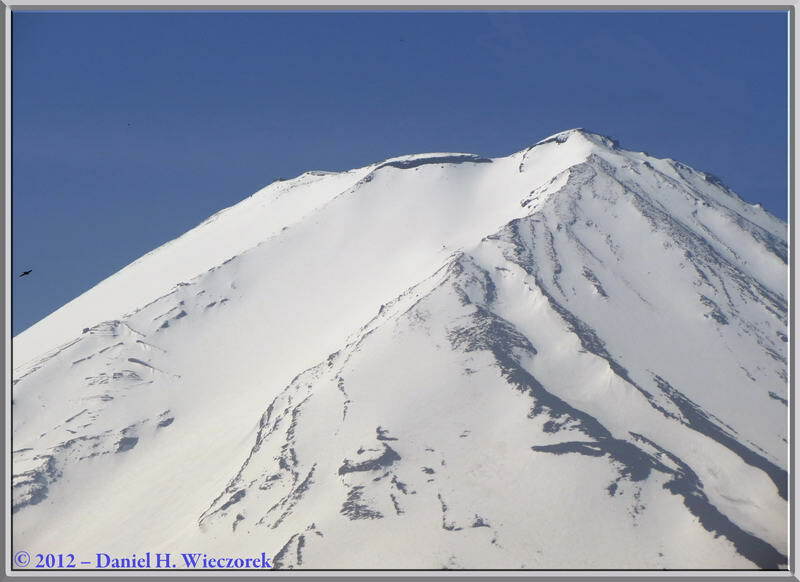 Fuji's summit area. 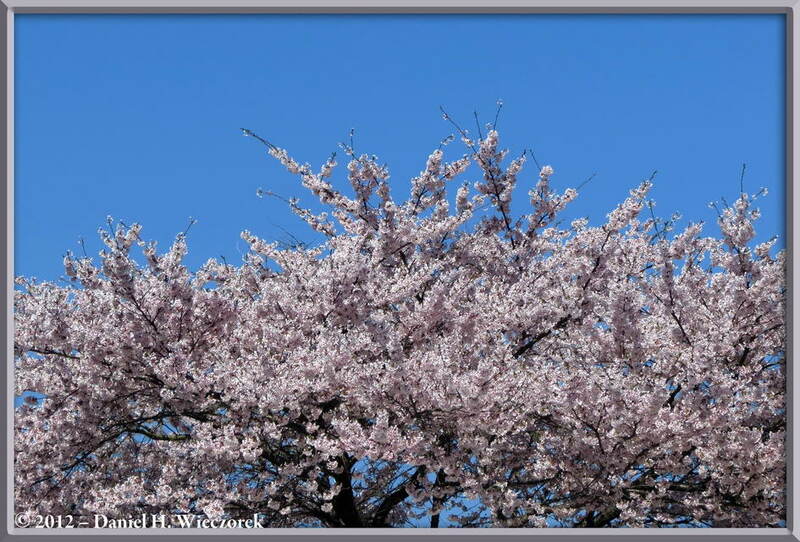 The 2nd shot is a cherry tree, also at Kawaguchi Lake Station. 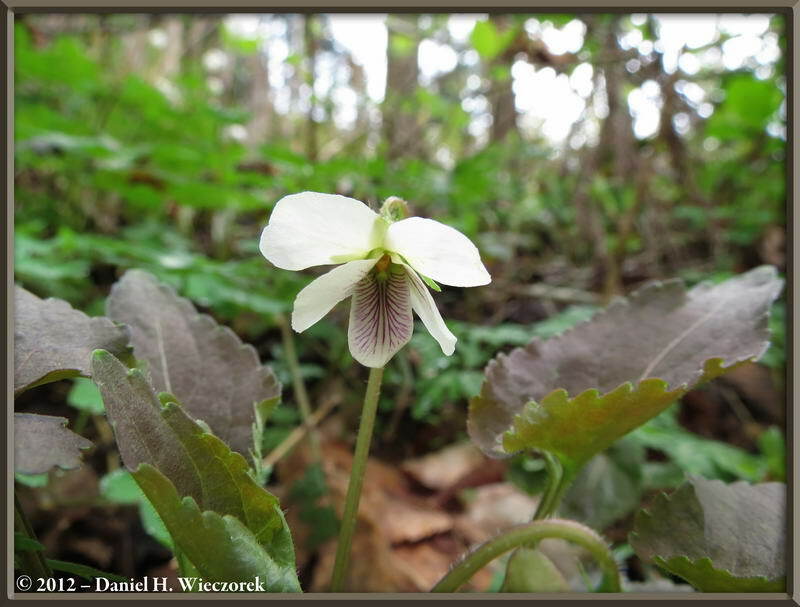 The 3rd shot is of Viola orientalis. This is very close to where we got off the bus. 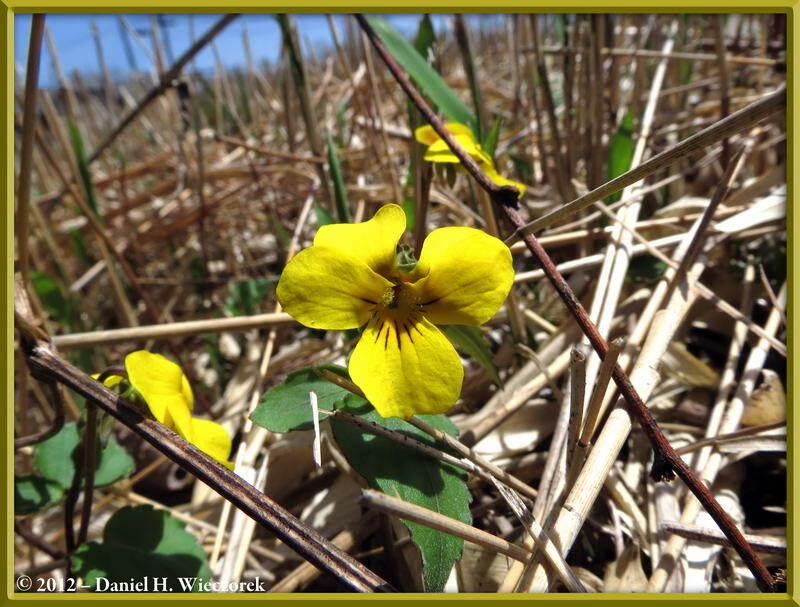 We went kind of crazy at this burned over field area taking photos of the Viola orientalis. 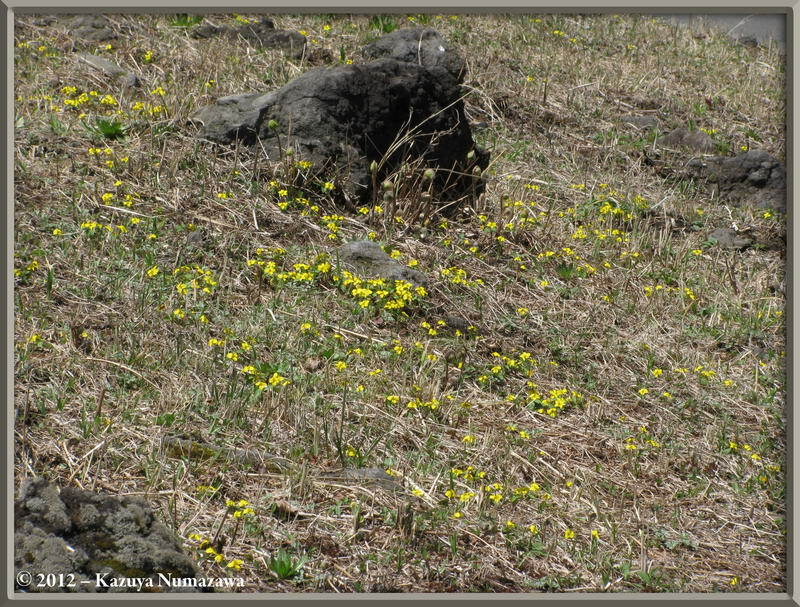 We do not see yellow violets around the Tokyo Area, so we always get excited over yellow violets. 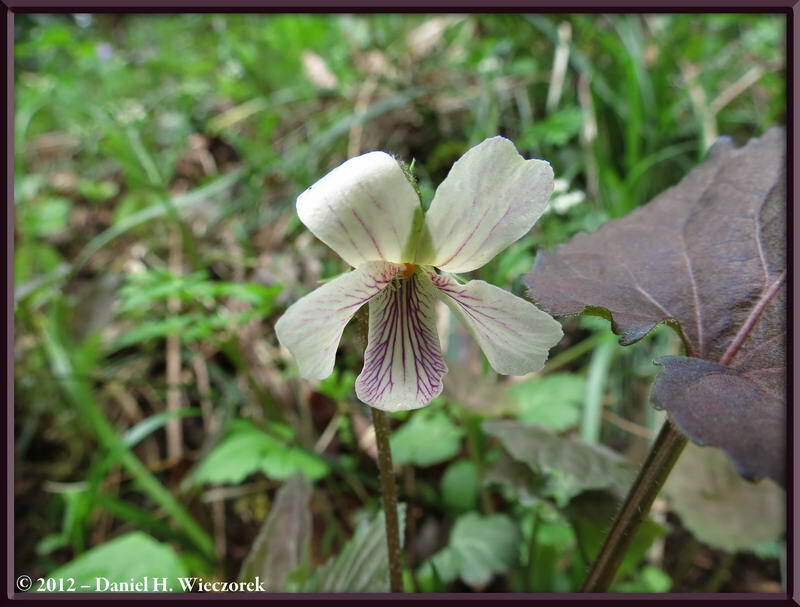 Here are the final 2 photos (for now) of Viola orientalis. 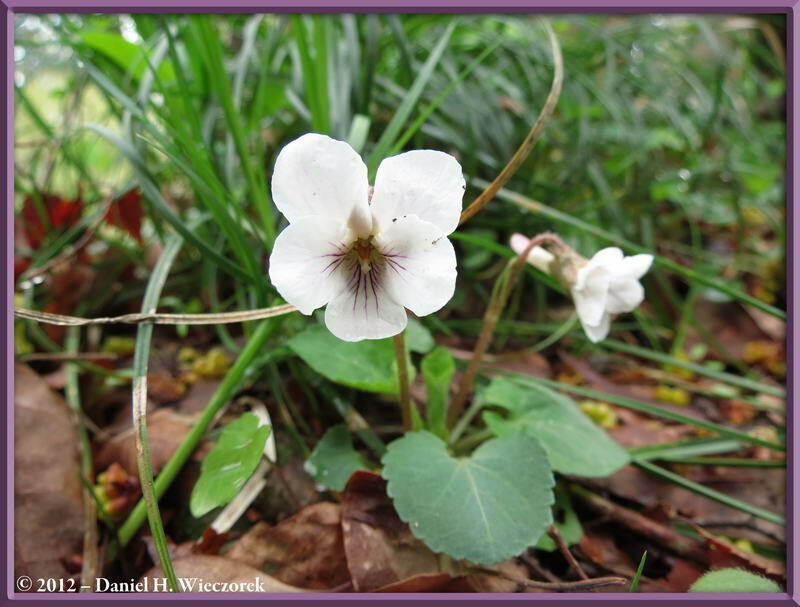 The 3rd shot is a fine example of Viola eizanensis. 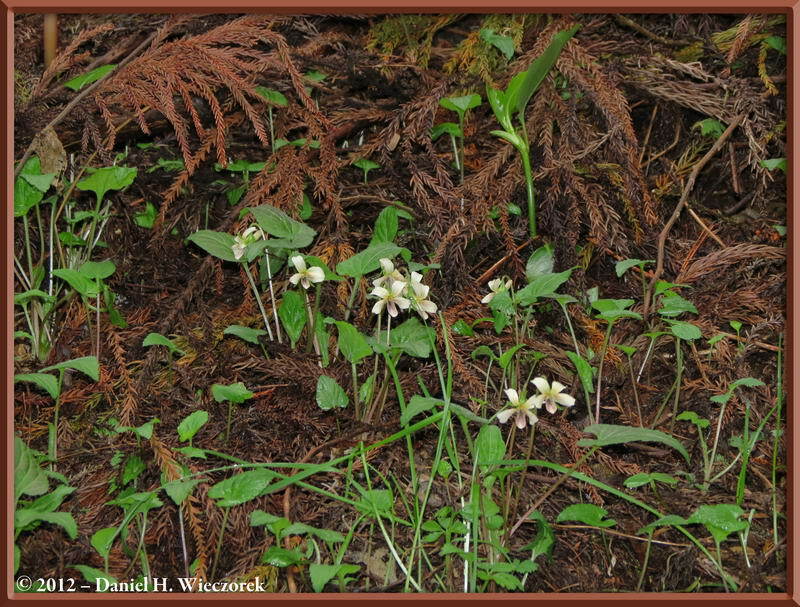 Here is a Viola eizanensis in first position, followed by a Viola tokubuchiana var. 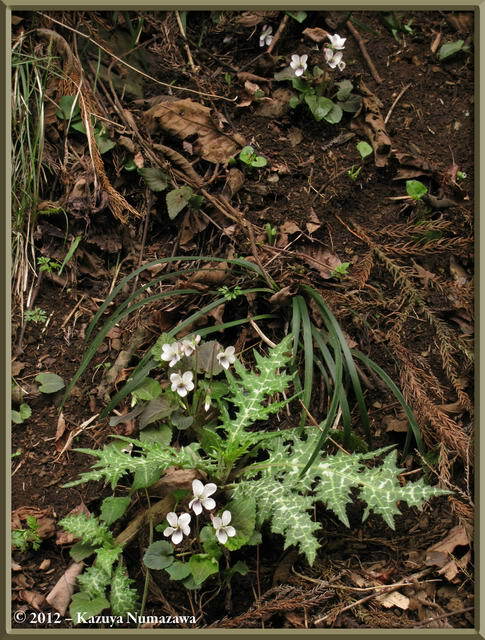 takedana f. variegata in 2nd position. 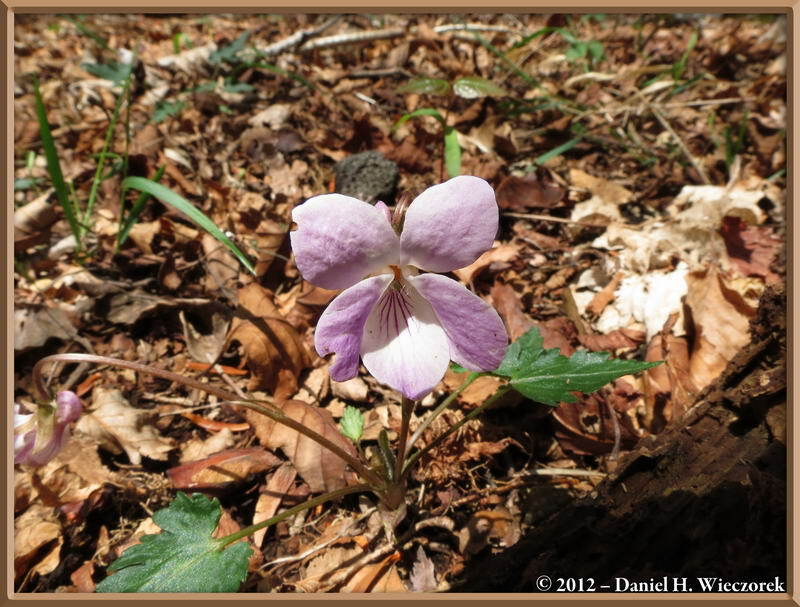 In 3rd position is an Okutama Violet - a Viola X savatieri. 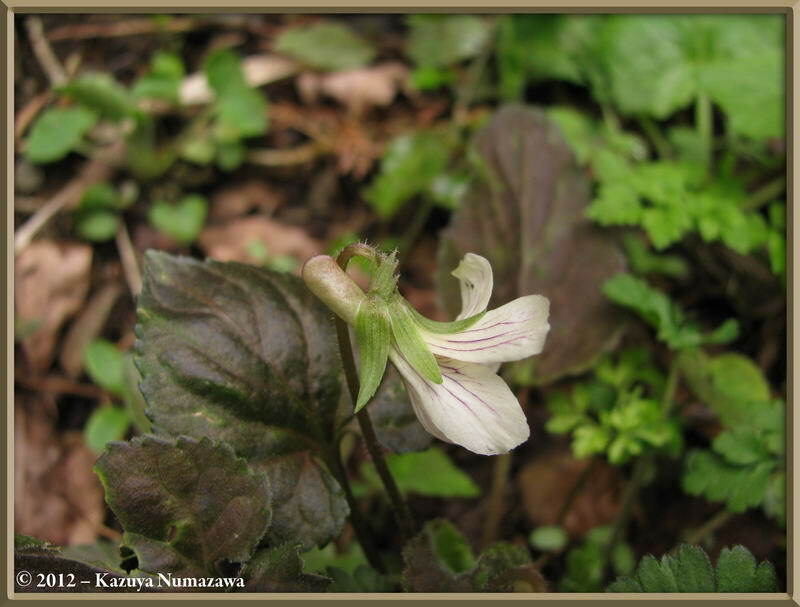 It is the hybrid of Viola eizanensis and Viola tokubuchiana var. takedana. 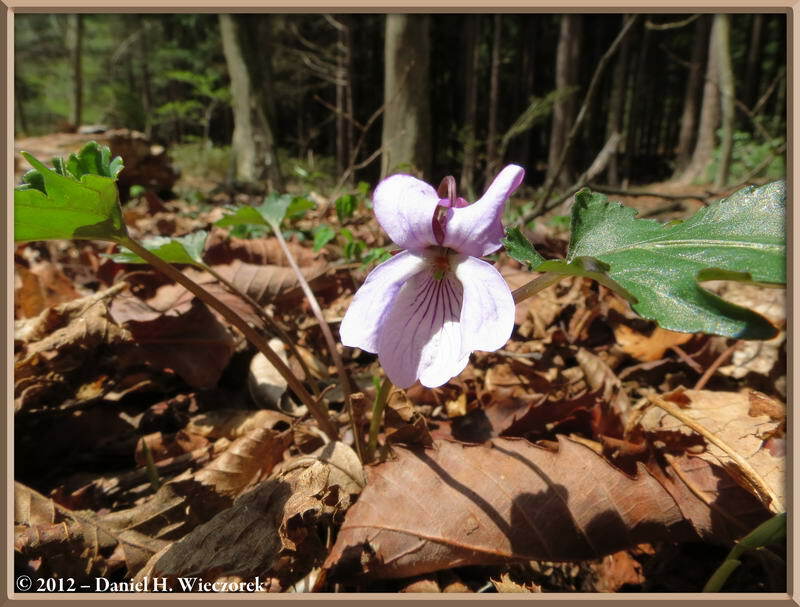 We have searched for this violet for years, but we've never found it in bloom before today. So, you should expect to see a few examples of it. 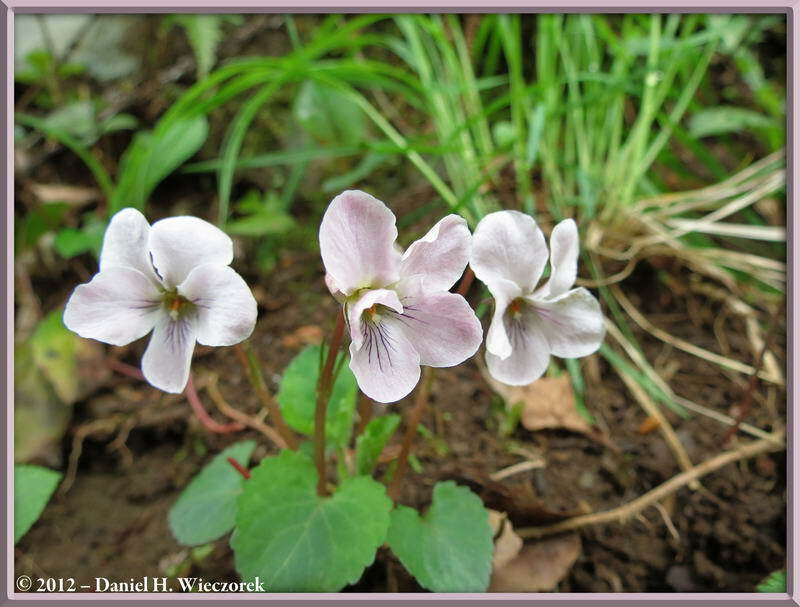 Here are 3 more shots of the Okutama Violet - a Viola X savatieri. 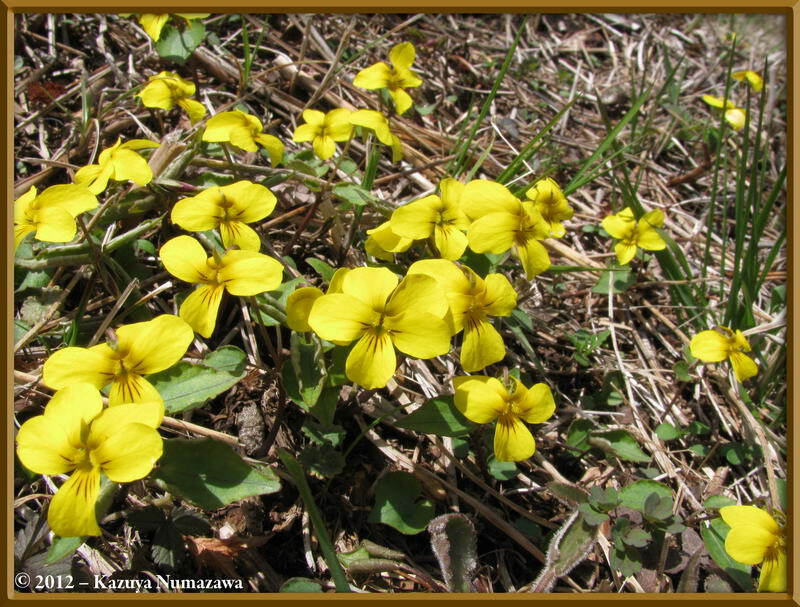 It is the hybrid of Viola eizanensis and Viola tokubuchiana var. takedana. 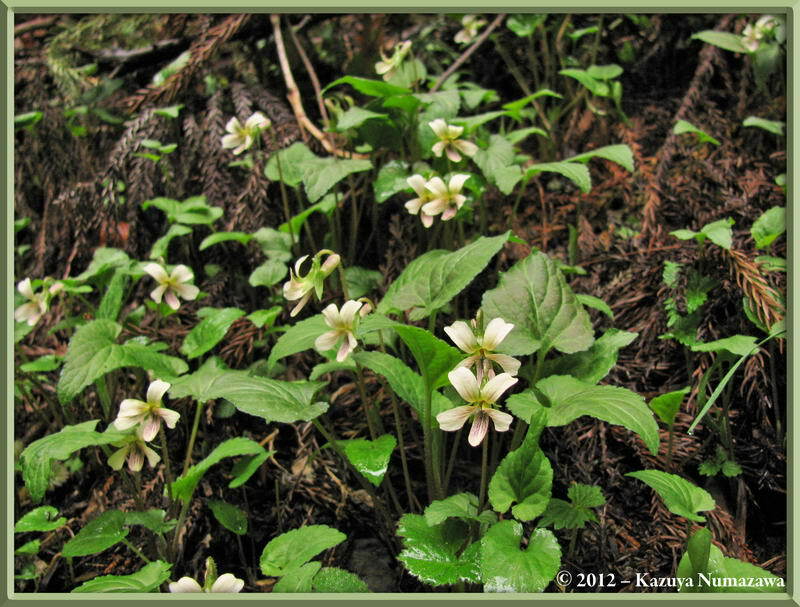 After we took an abundance of photos of the Okutama Violet we scoured the surrounding forest for more and we found another hybrid. 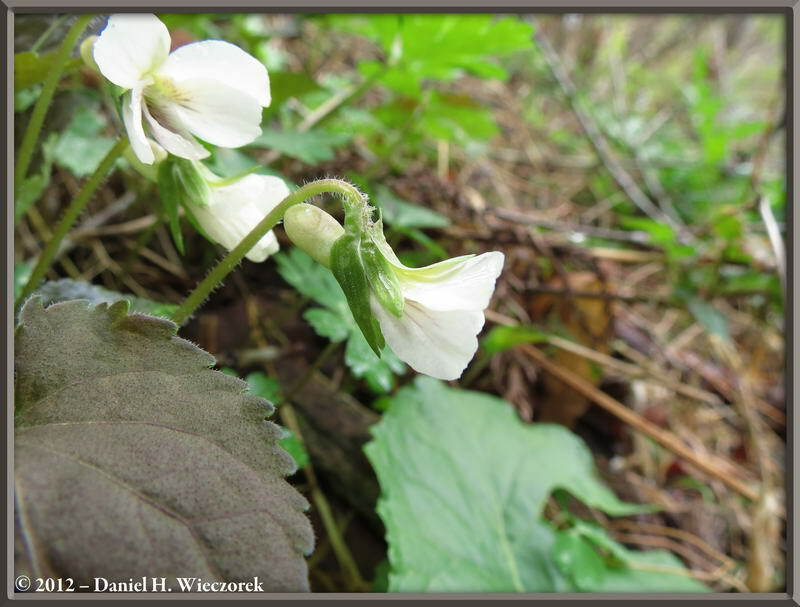 This one is not even in our book, but it has been reported on the web before. 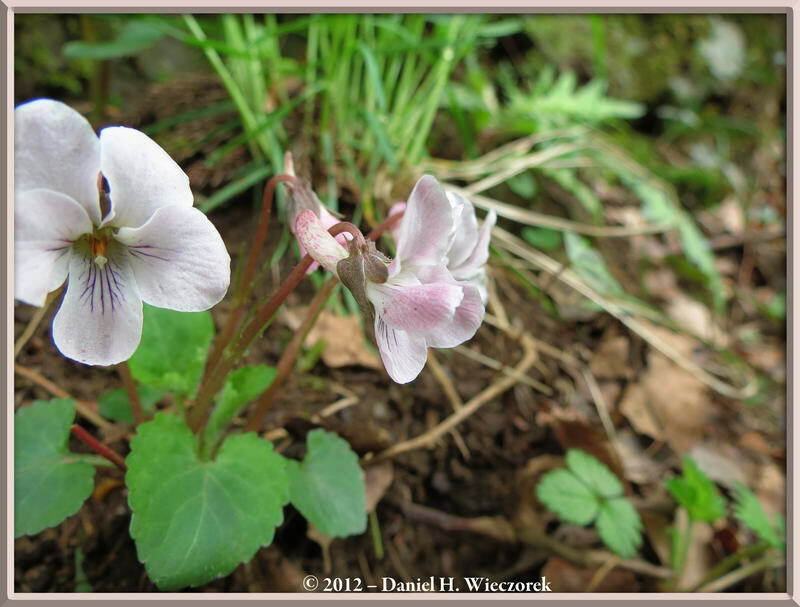 This is the hybrid of Viola eizanensis and Viola bissetii. 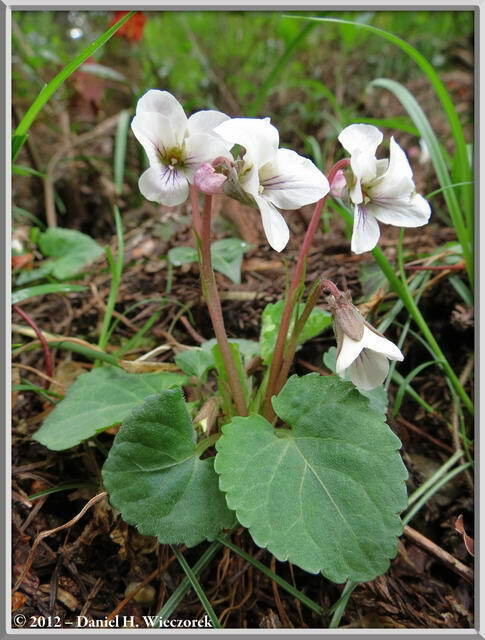 The flower definitely looks similar to Viola bissetii, but the flower of V. bissetii has no interior hairs. 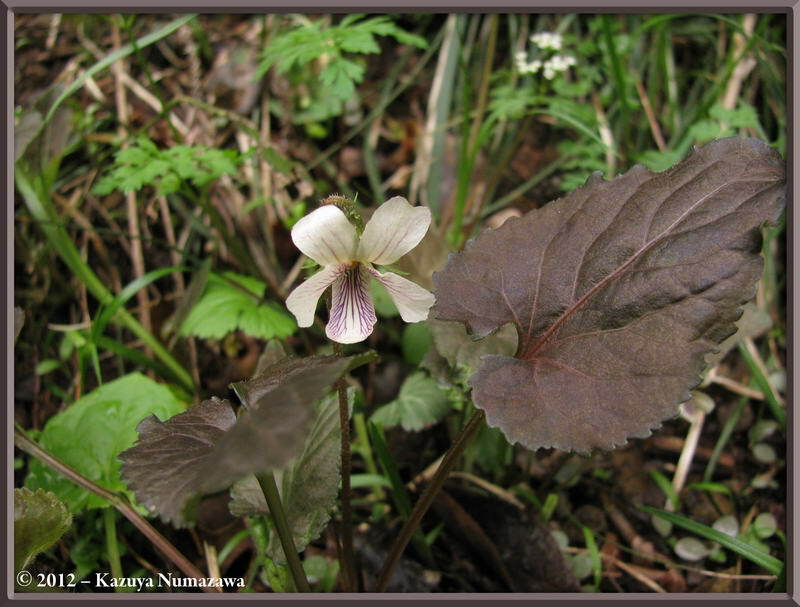 The backside of the leaf of this one is green - as shown, while the backside of the leaf of the Okutama Violet is purplish brown. 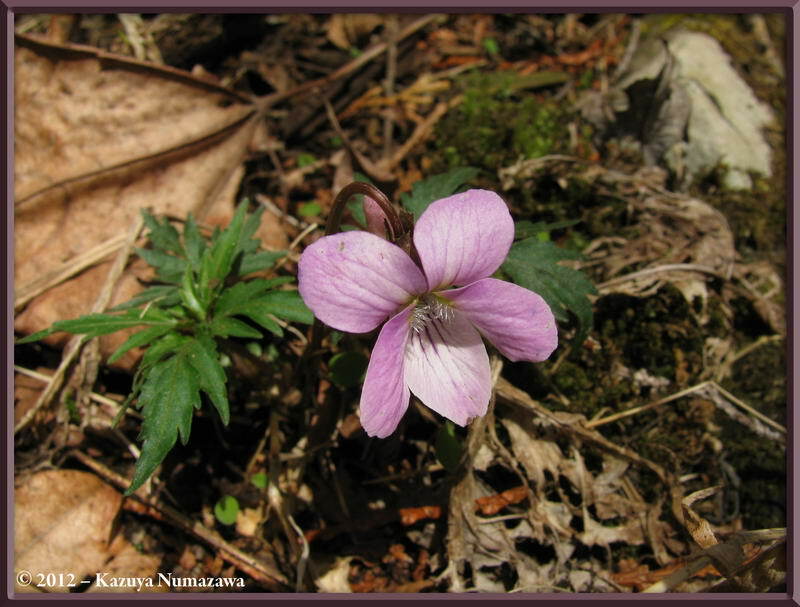 The differences between this and the Okutama Violet are easily noticeable. 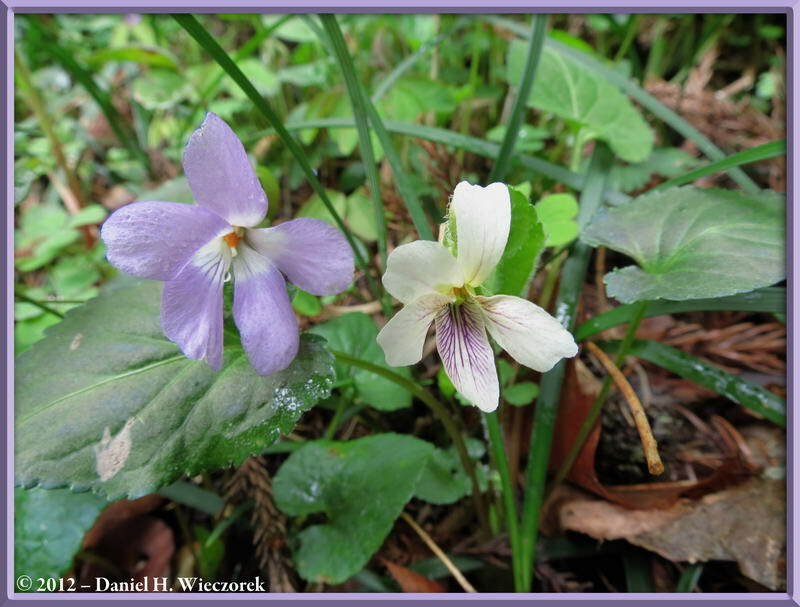 Here are 2 final shots of the hybrid of Viola eizanensis and Viola bissetii in 1st and 3rd position. 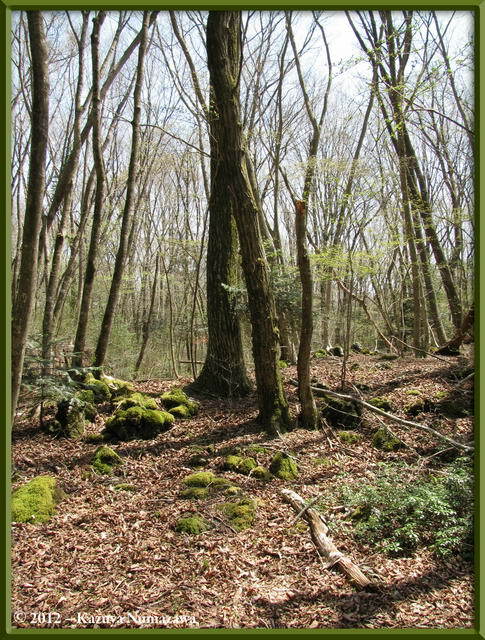 In 2nd position is a photo of Forest Scenery in this area. 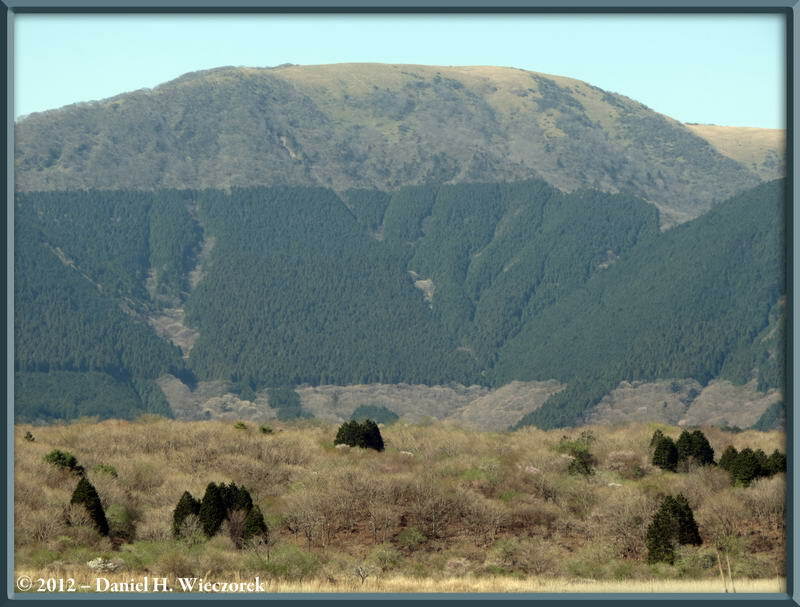 As we continued on our hike we saw this strange mountain shown in 1st position - why is there such a distinct line on the mountain where the forest changes from coniferous to hardwood? Can anybody answer that question? 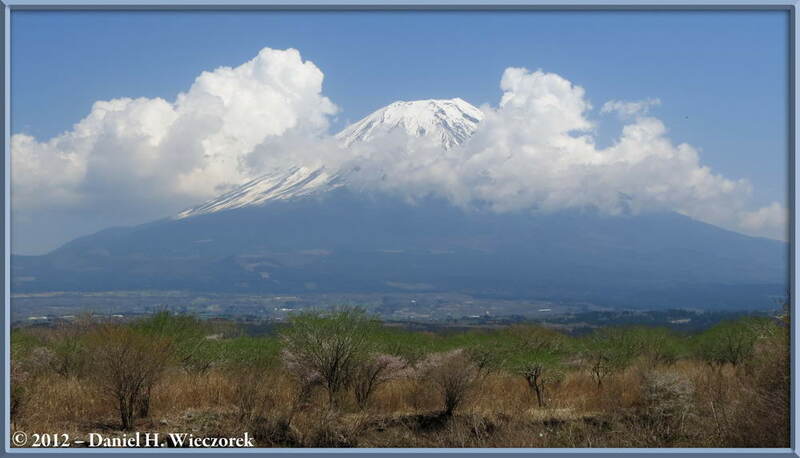 The 2nd and 3rd shots show Mt. Fuji. 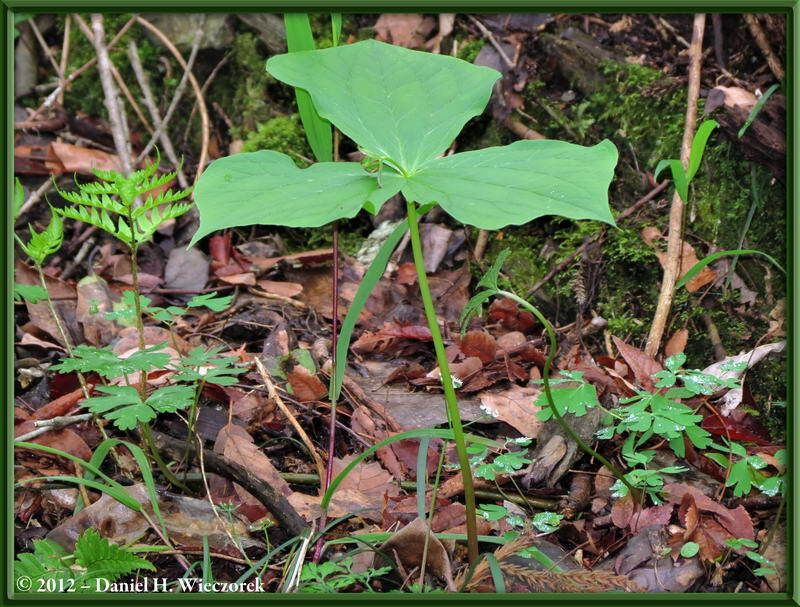 Here is a shot of Trillium smallii in first position. That is followed by 2 more shots of photogenic Mt. Fuji. 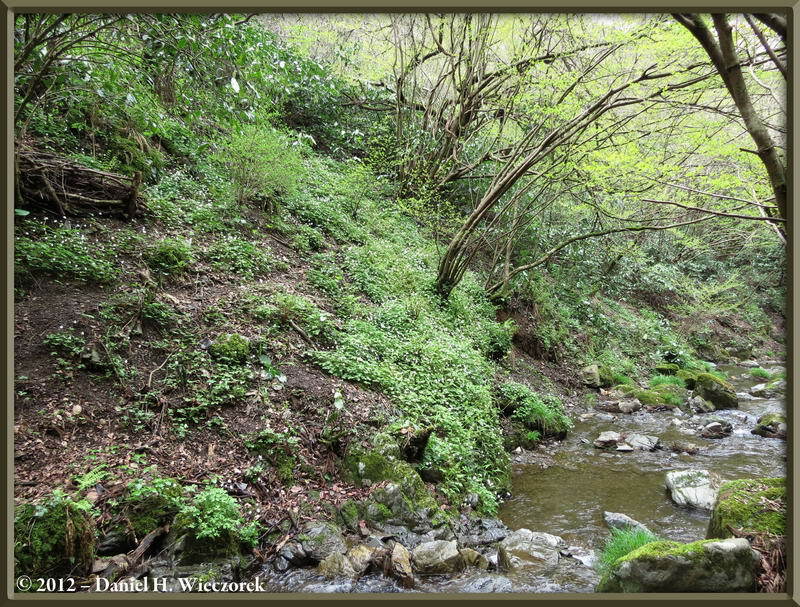 The first shot in this row shows the soft greens of early spring. 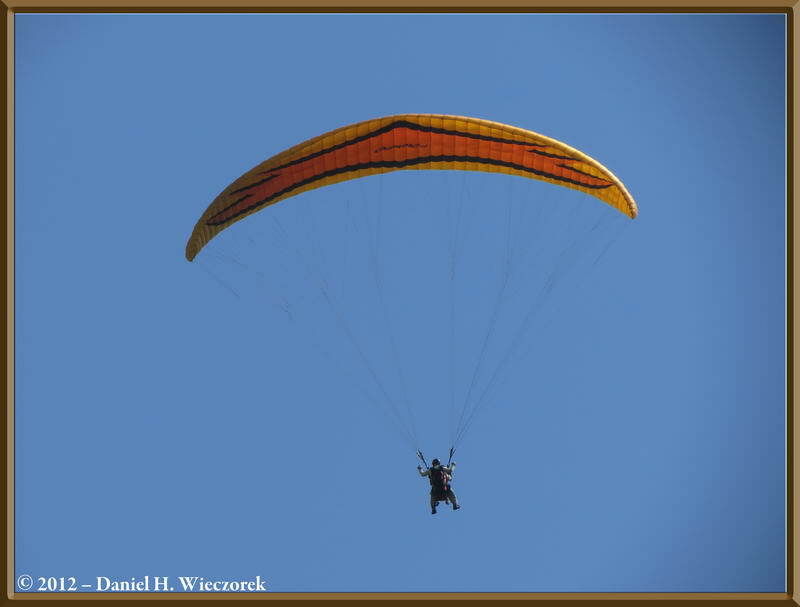 The 2nd shot shows a paragliding person. 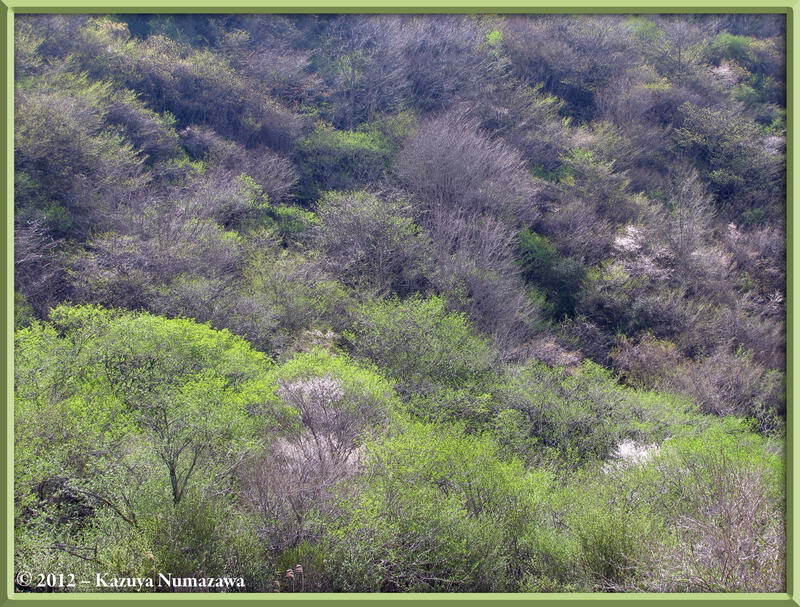 There is a well known paragliding hill near here. 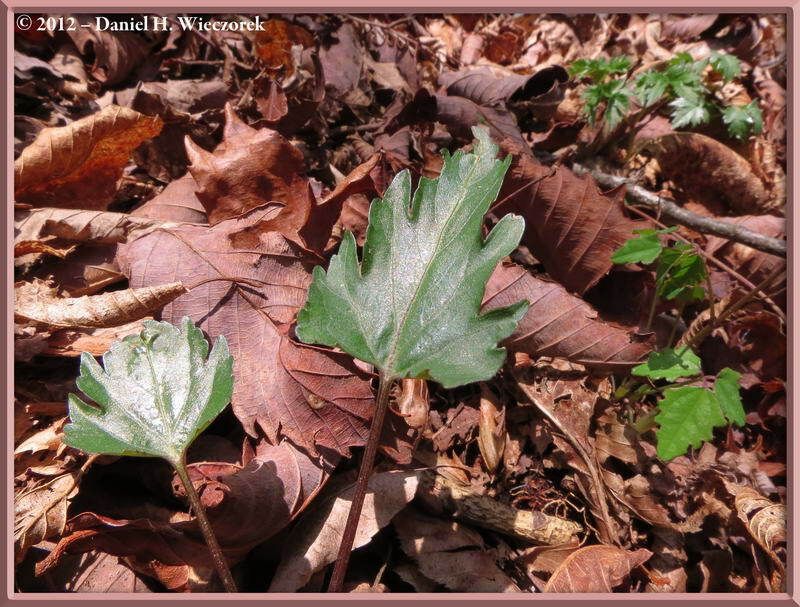 The 3rd shot again shows that mountain with the distinct line marking where the forest type changes from hardwoods to conifers. Note that it happens at both the lower level and also the upper level.